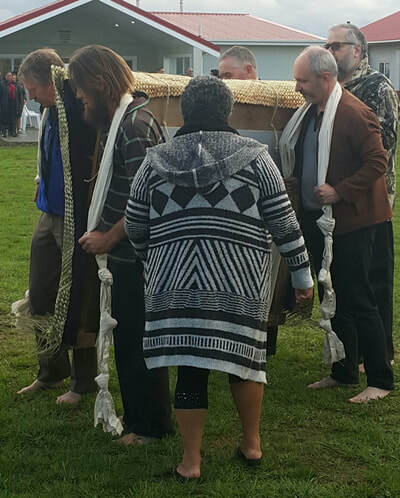 The gifting of Te Koha to Ngaruahine was on the weekend of 24/25 March, 2018 with assembly at 6pm on Friday in Hawera. 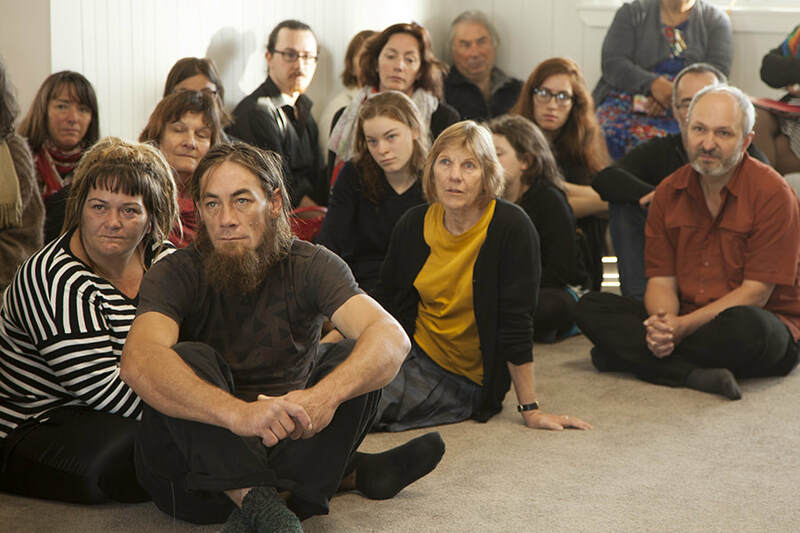 After the gifting people gradually left the region with the last of us heading away on Wednesday the 28th. I am incredibly grateful to all of you who came to support me and missed my friends who couldn't be there. You were with me in spirit. Ngaruahine were brilliant and gracious hosts. My 'ope' were stunned by the warmth of the welcome and the generosity of hospitality. 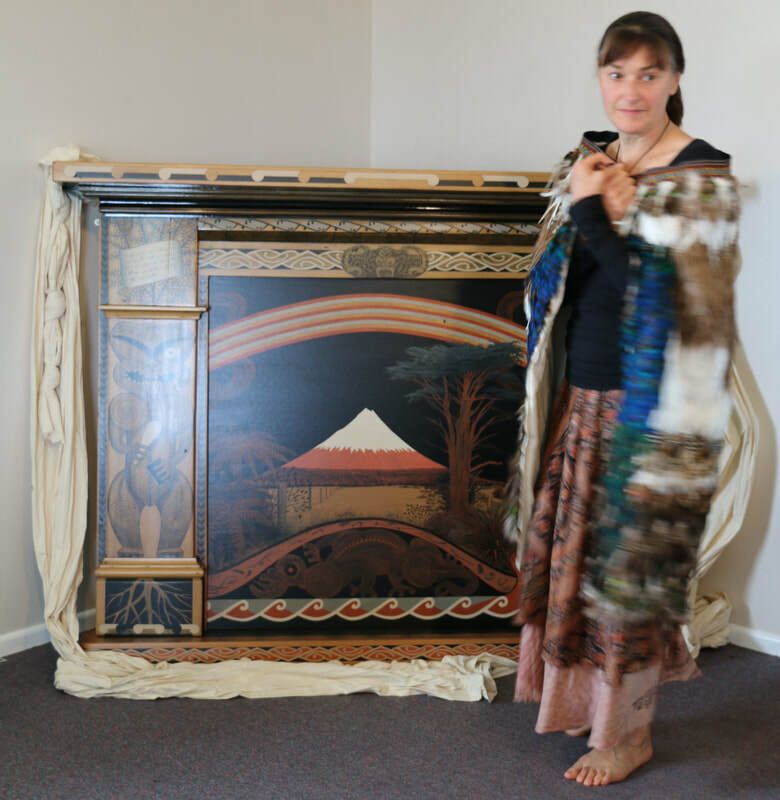 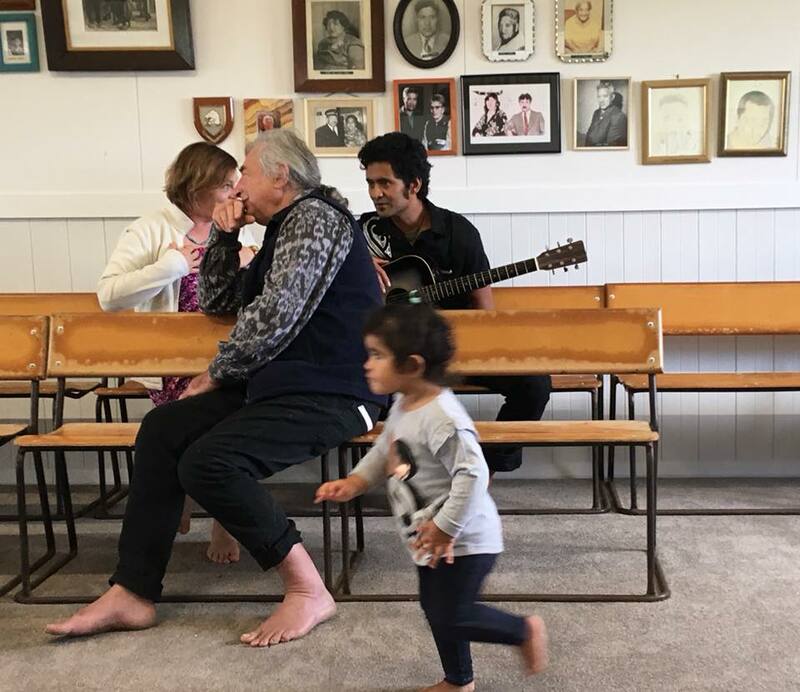 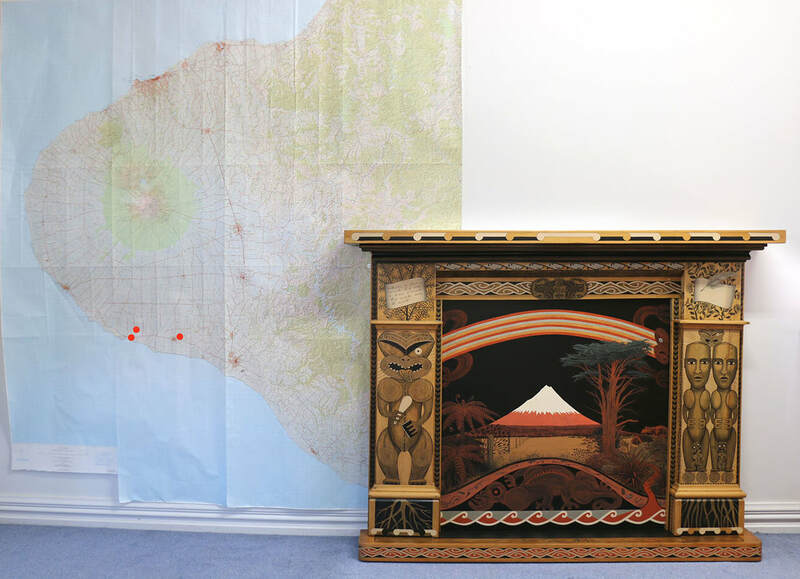 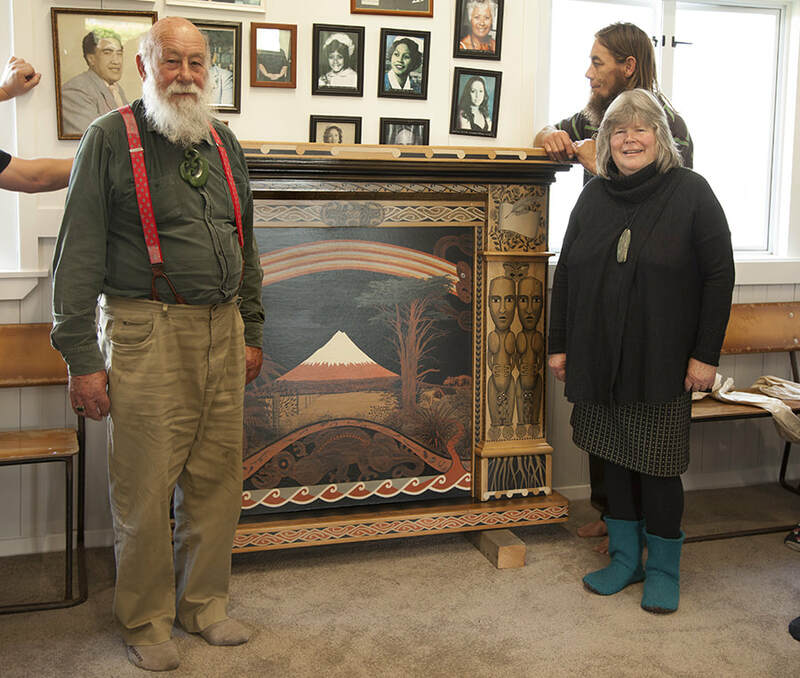 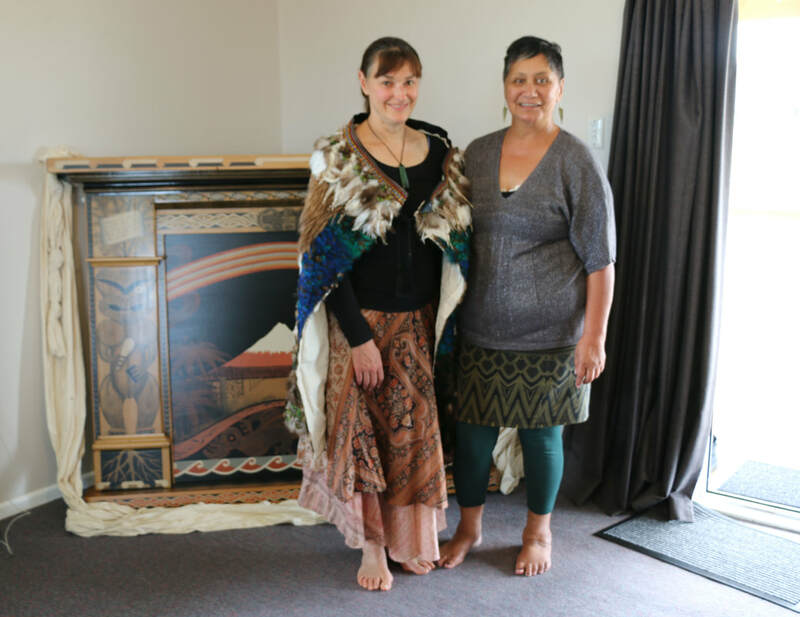 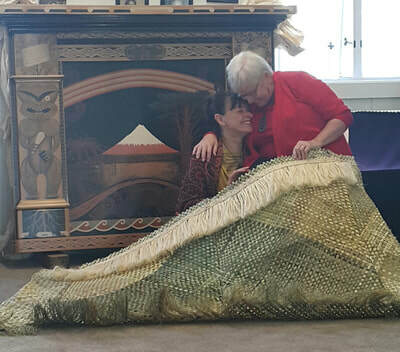 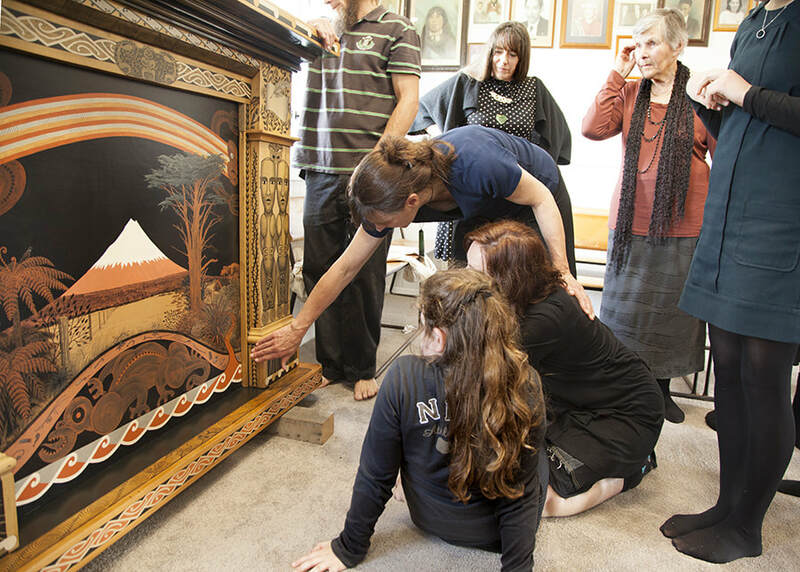 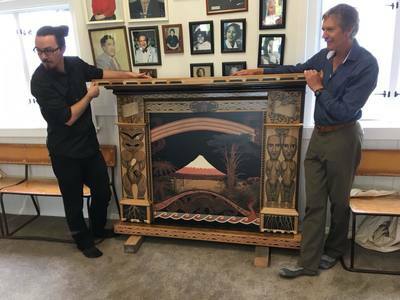 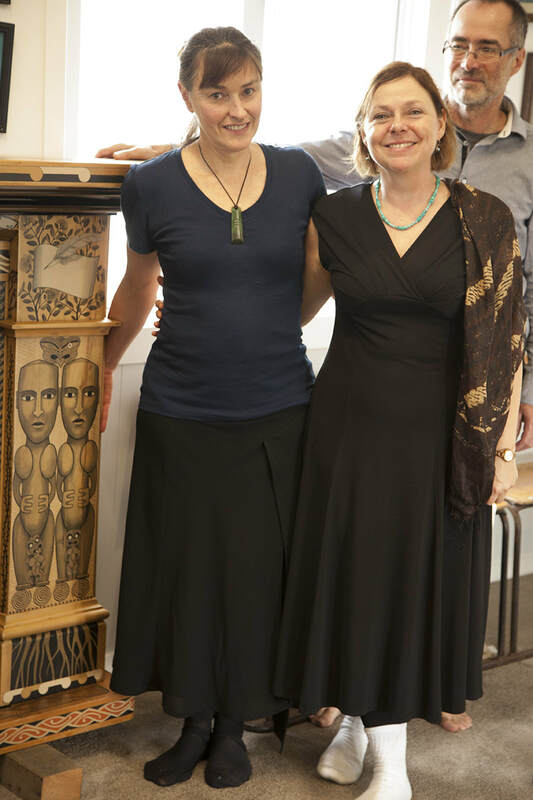 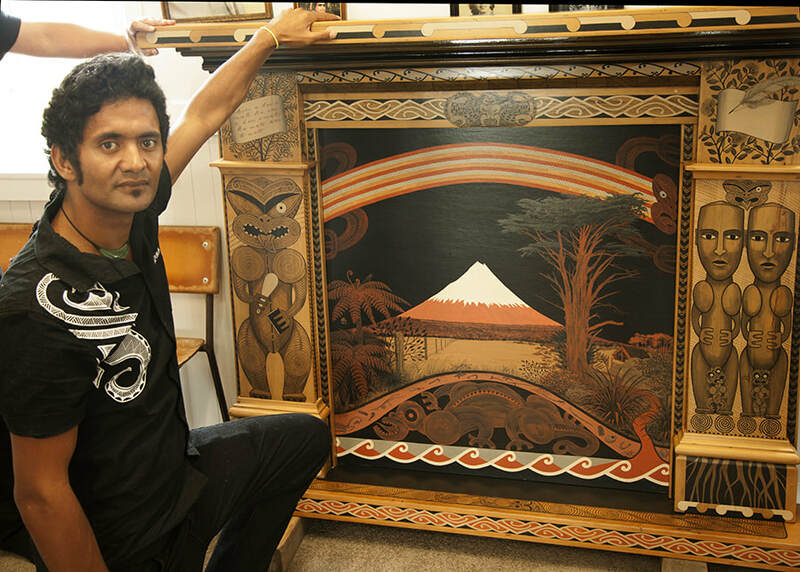 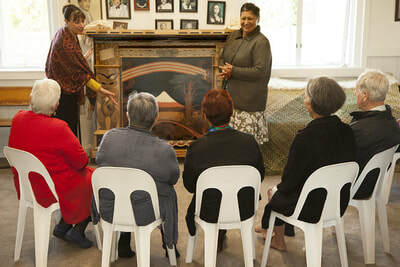 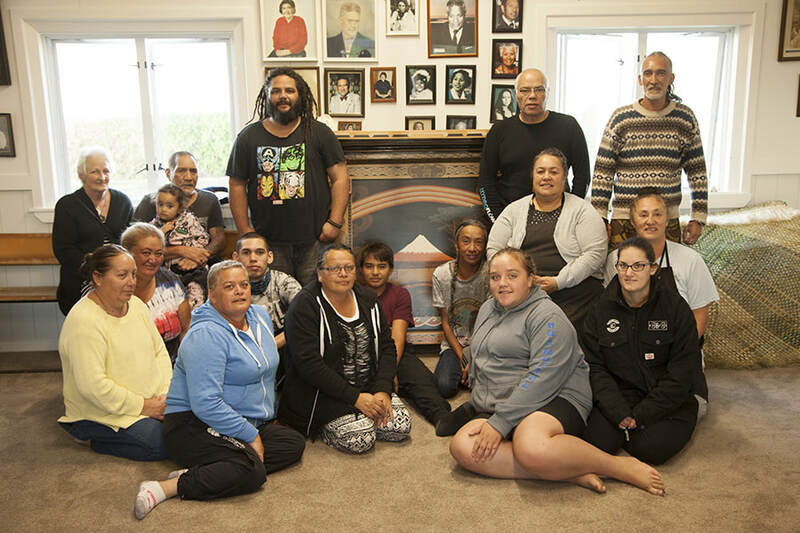 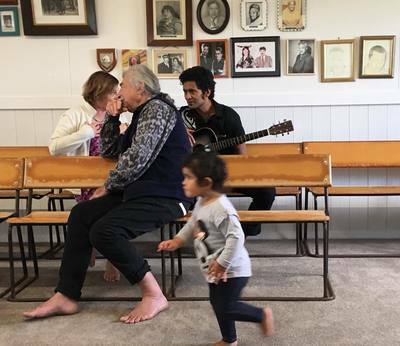 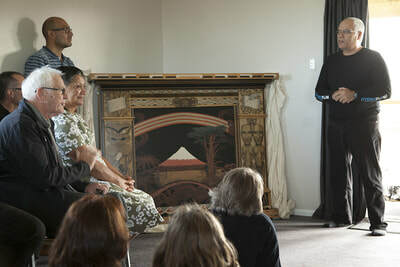 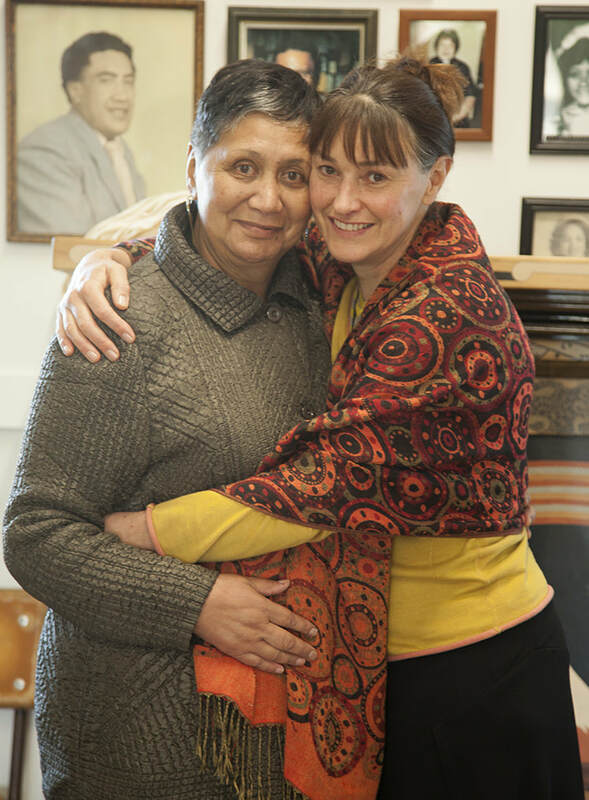 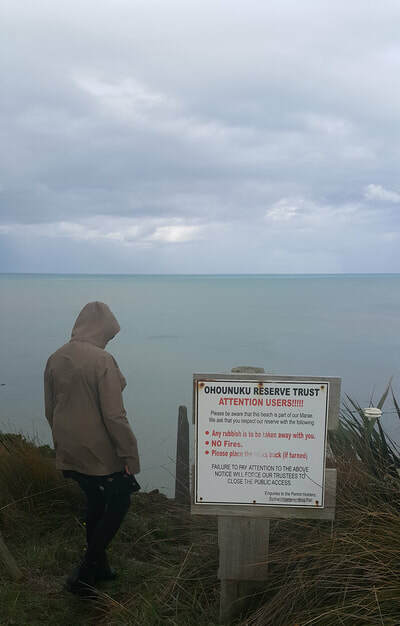 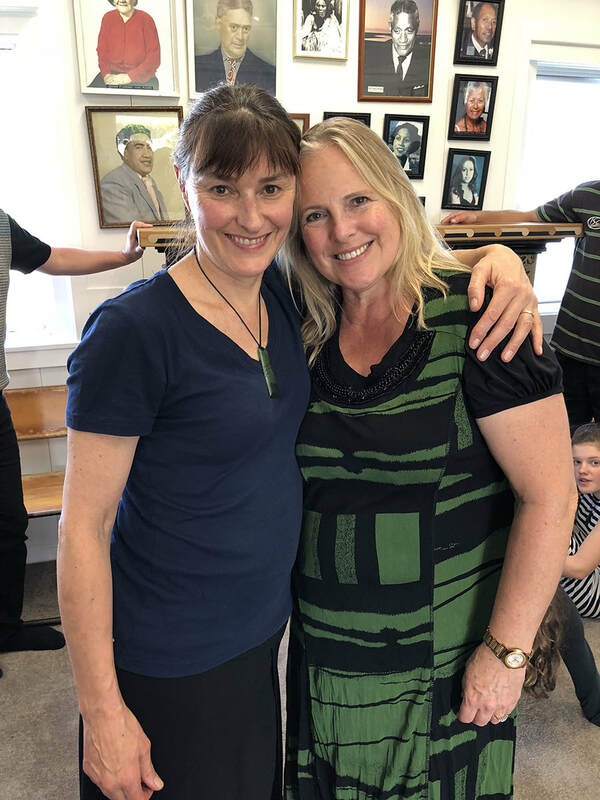 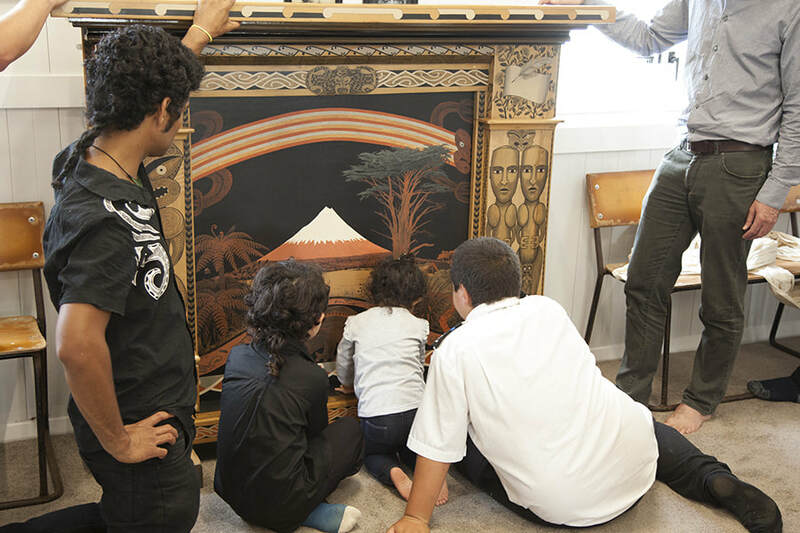 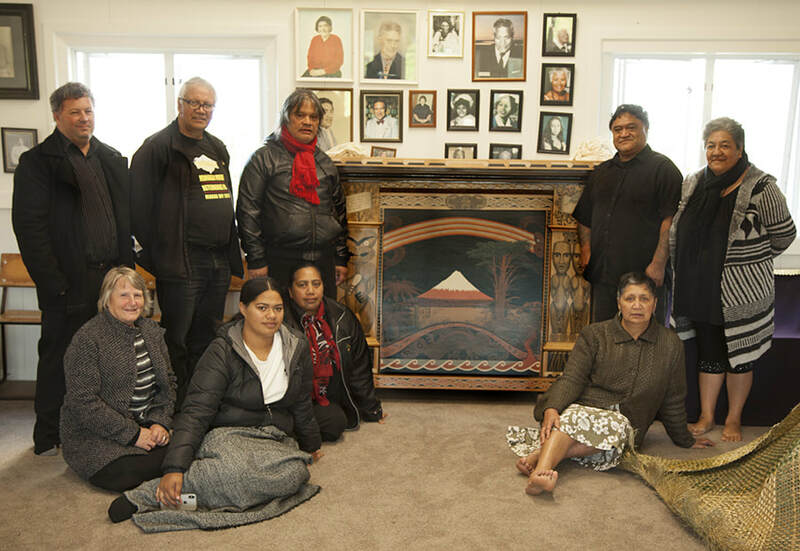 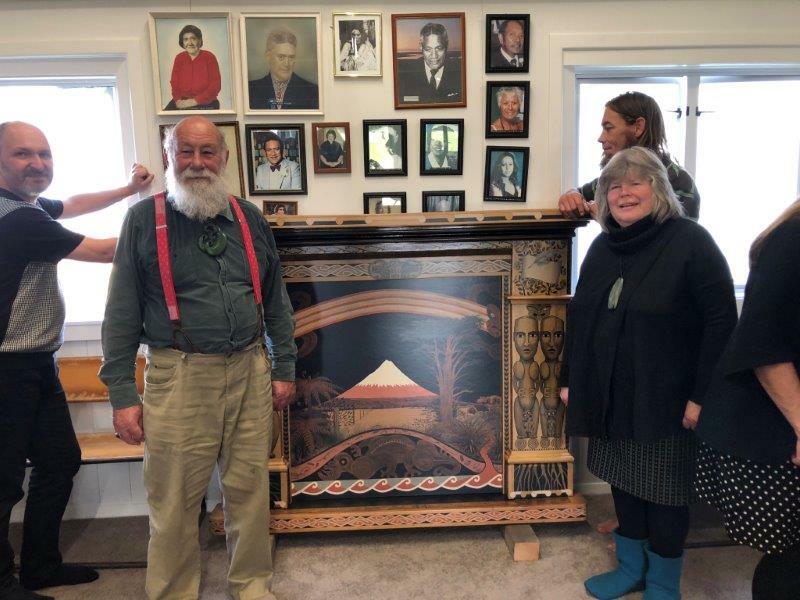 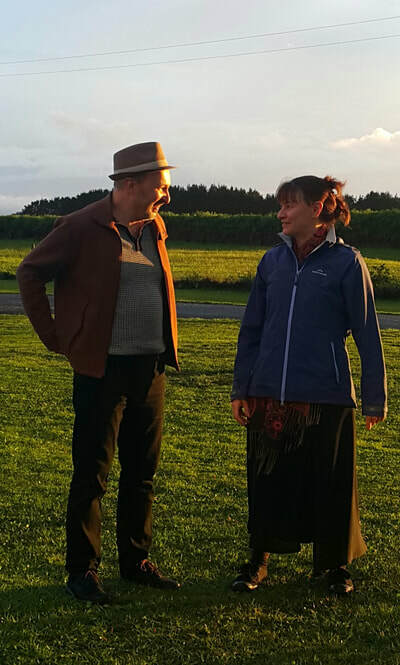 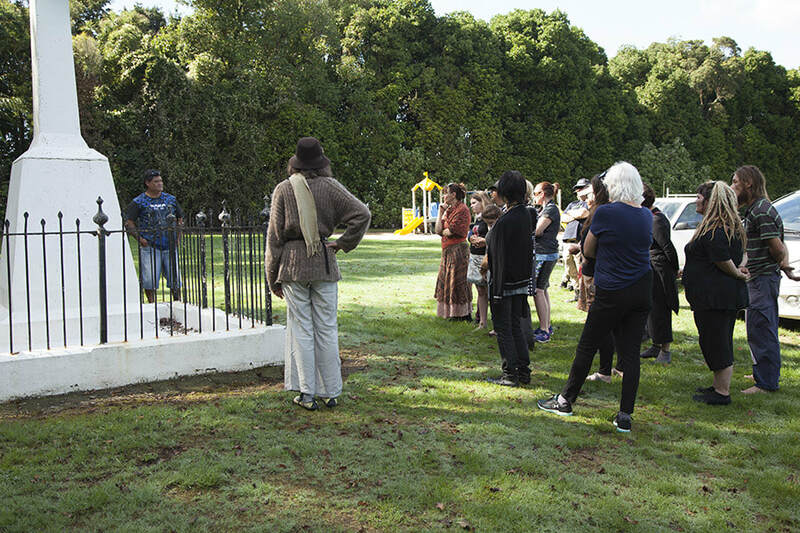 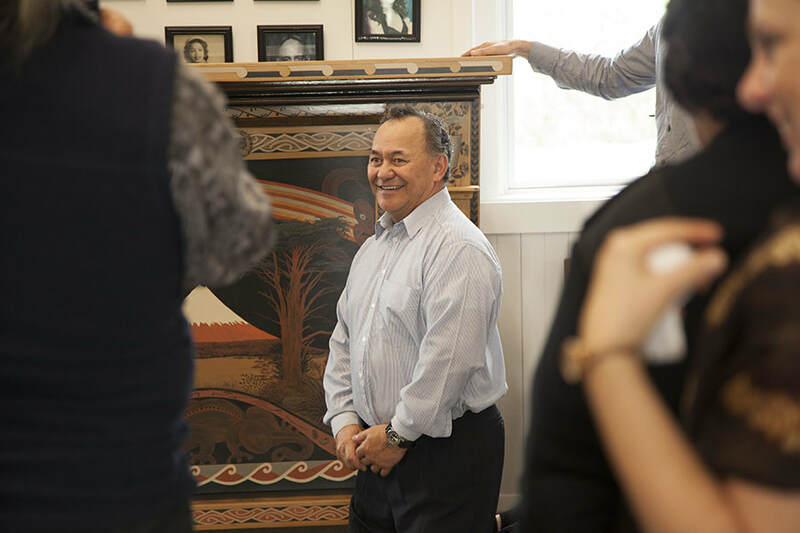 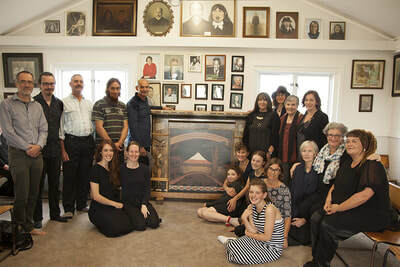 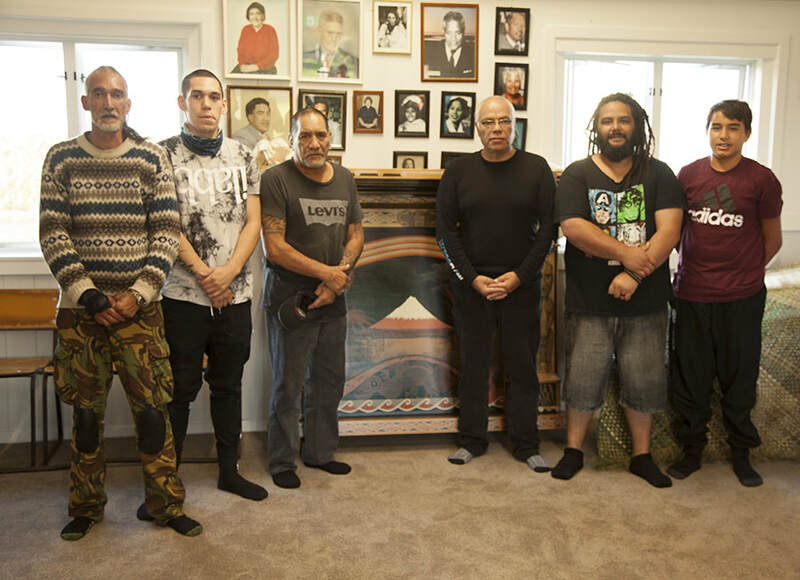 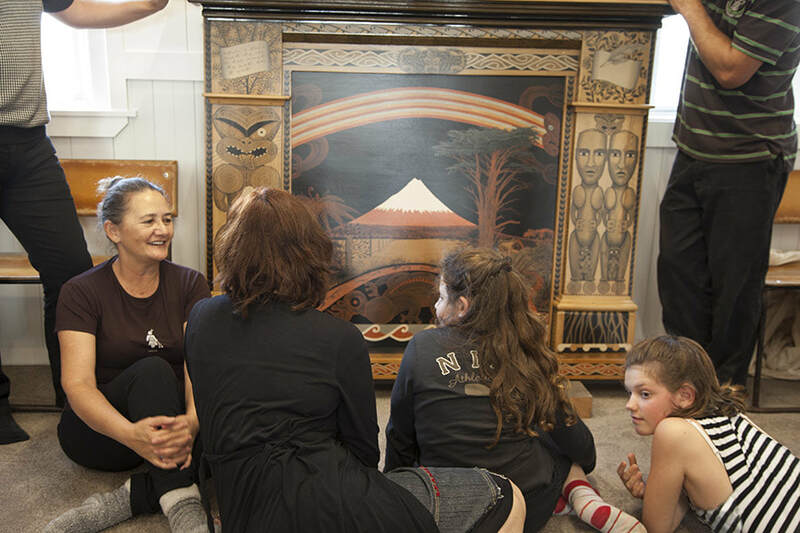 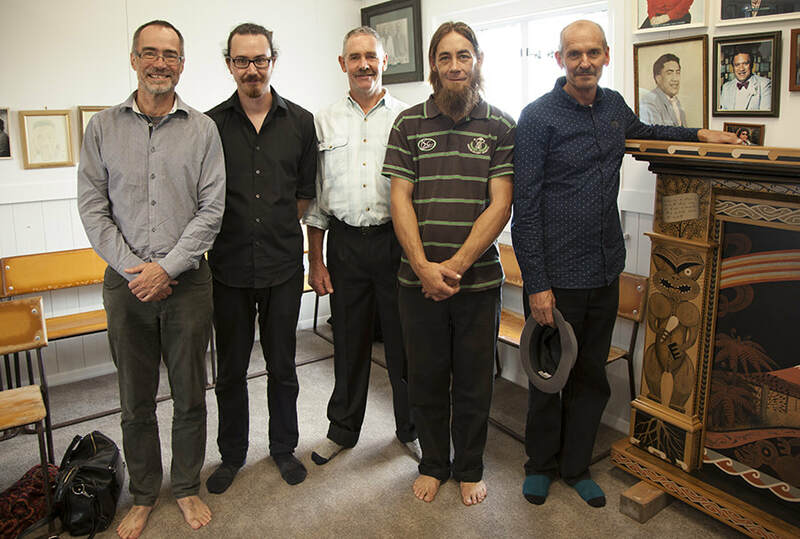 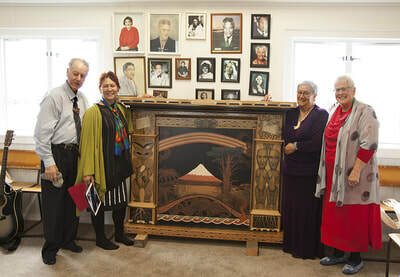 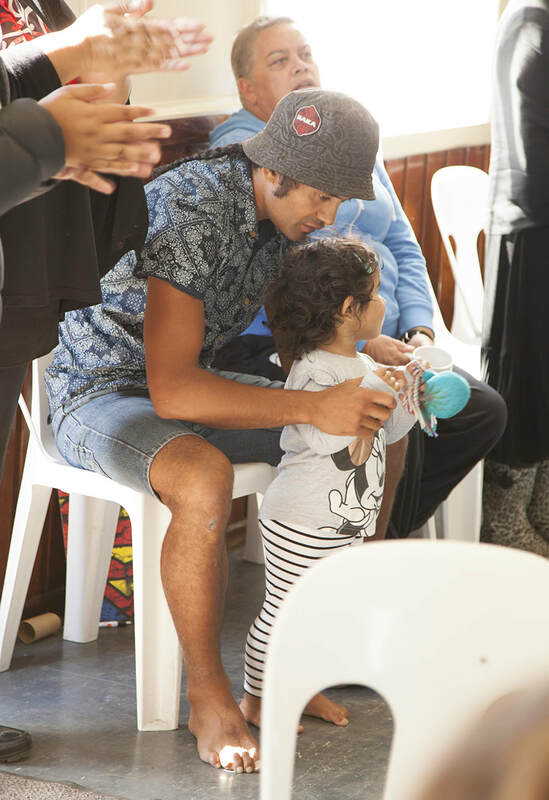 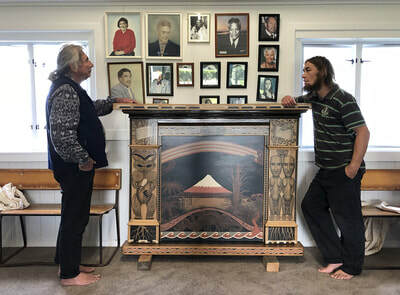 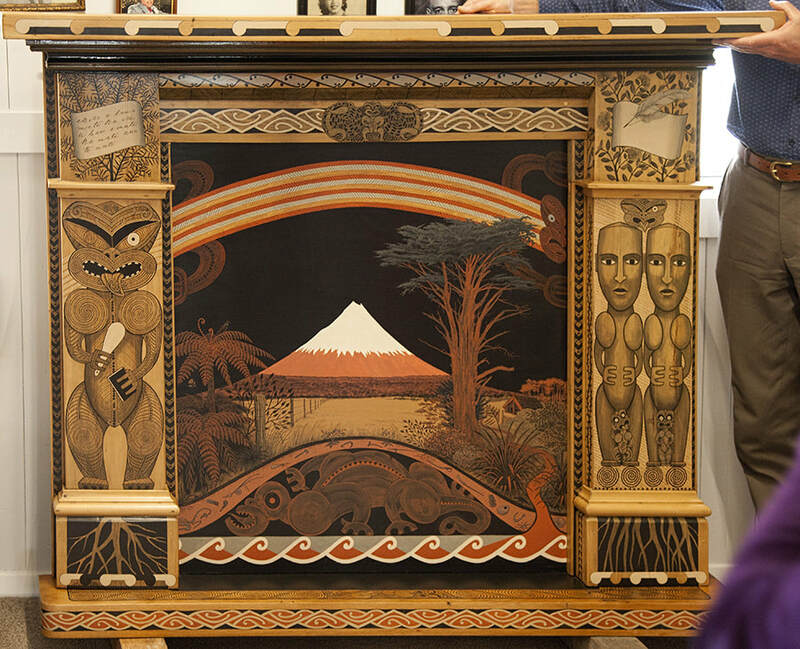 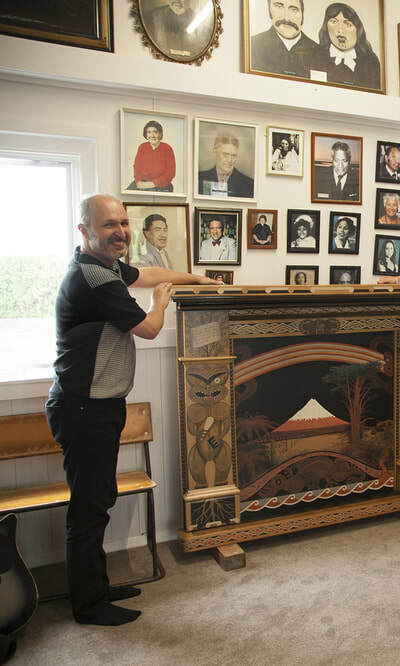 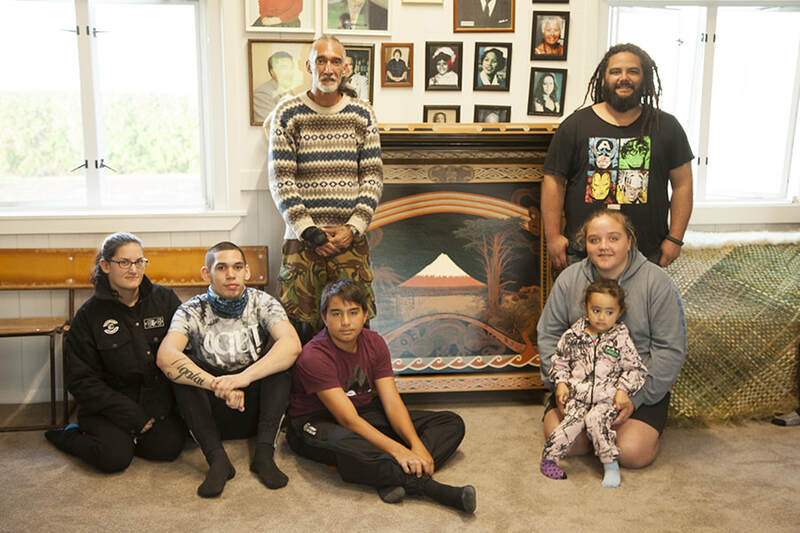 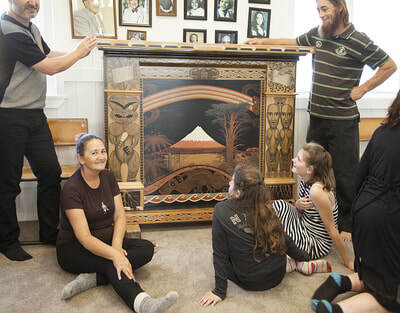 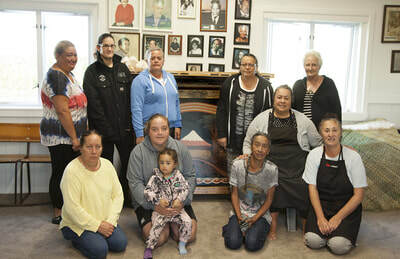 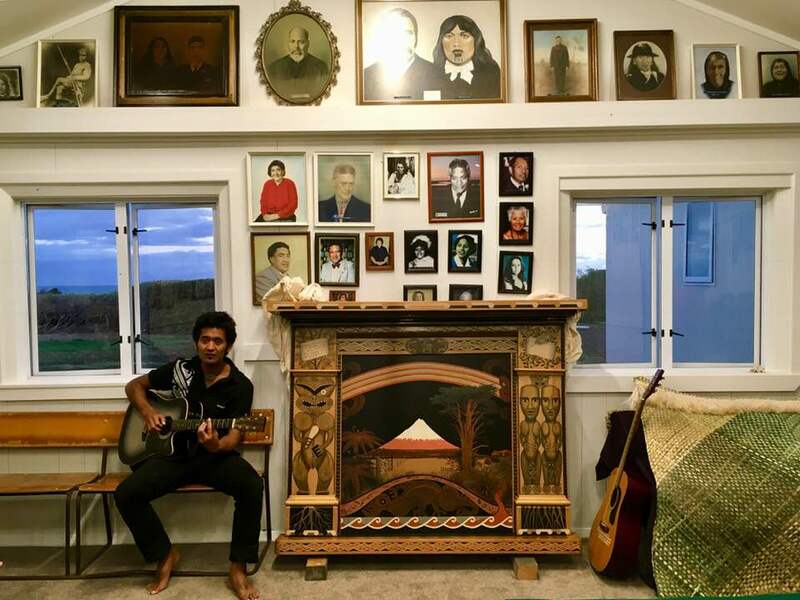 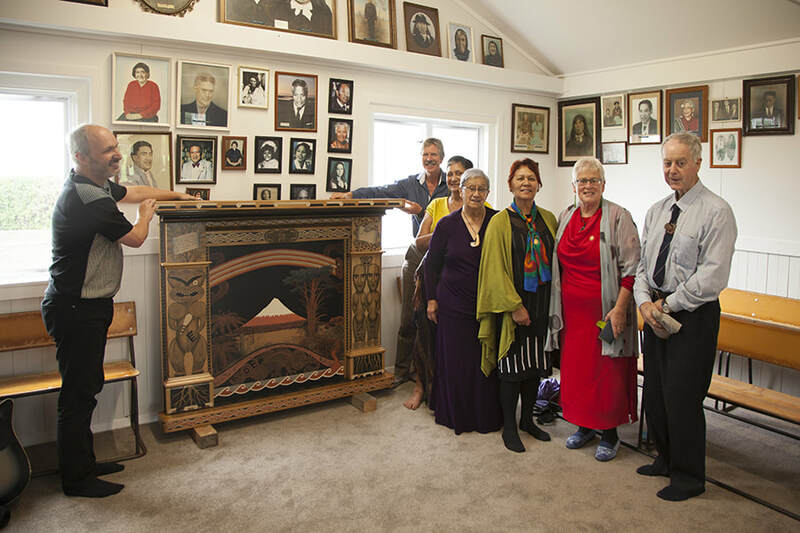 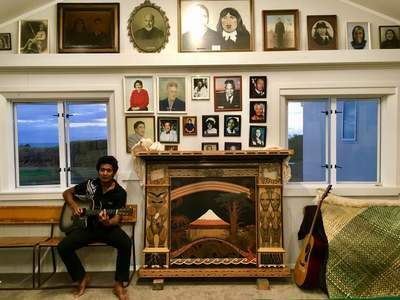 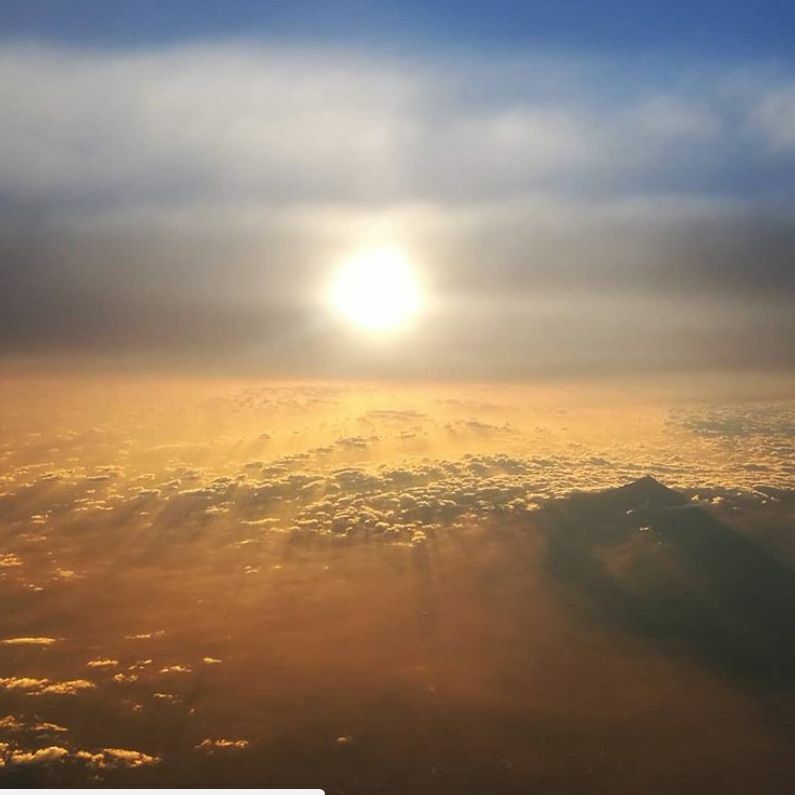 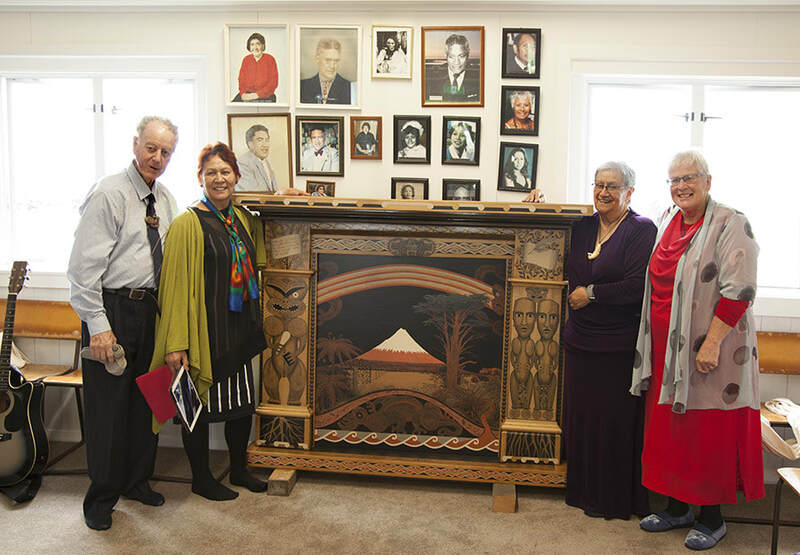 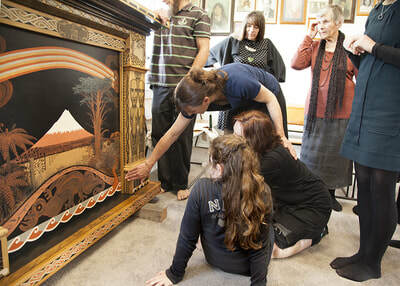 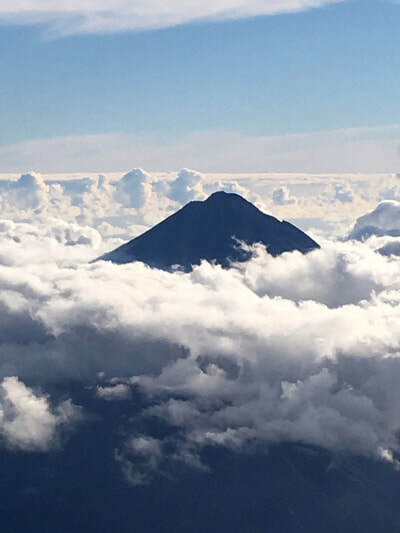 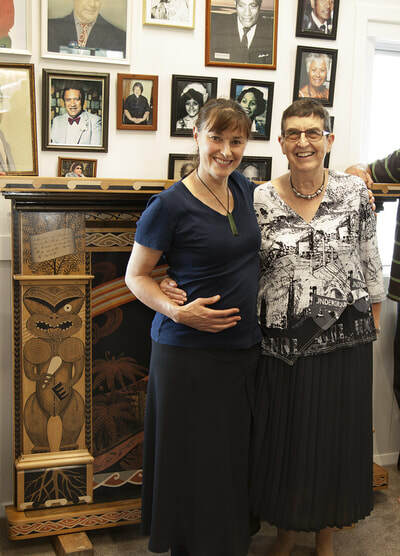 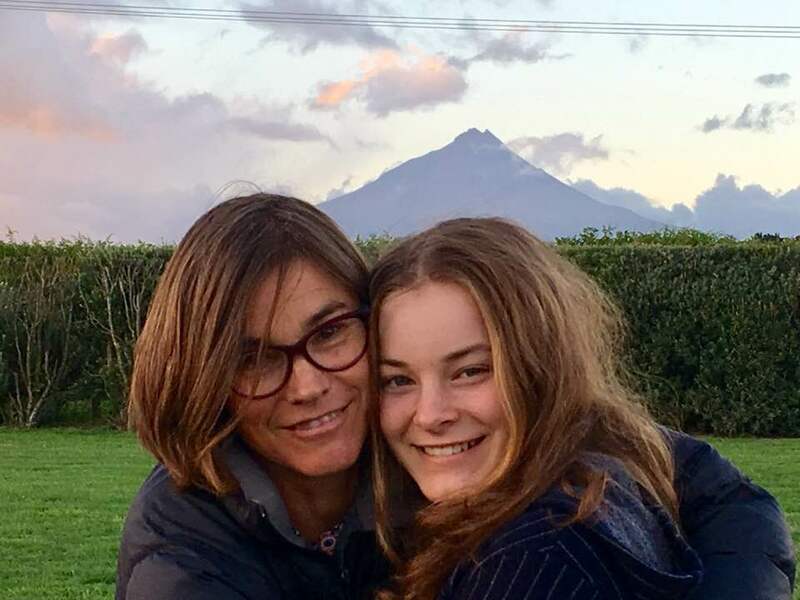 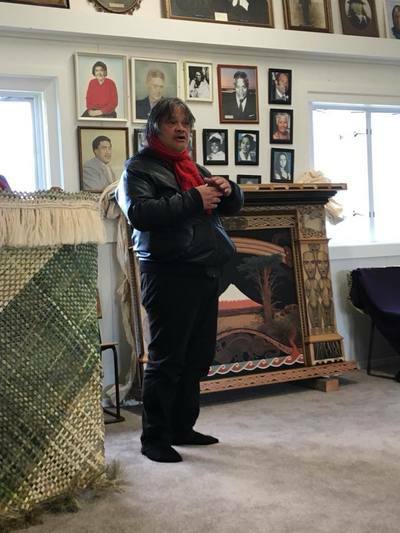 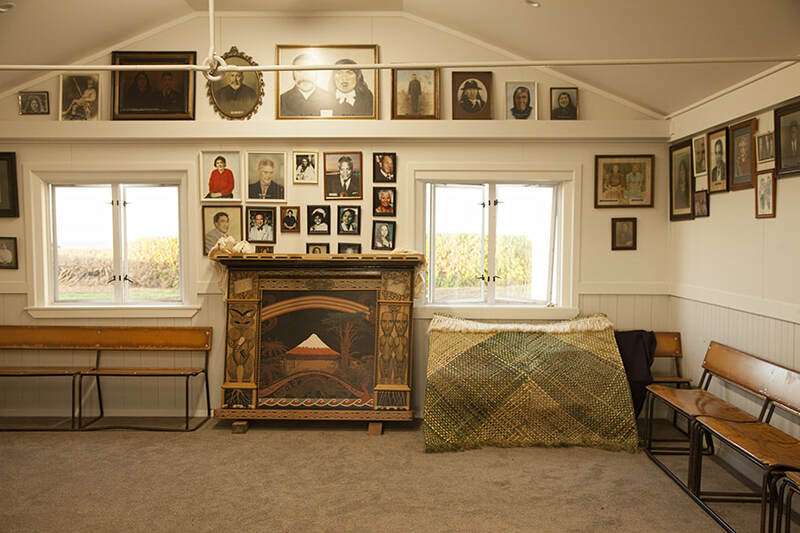 I am eternally grateful to my friend Te Rau Oriwa Davis and to all of Ngati Hāua hapu for their promise to care for my gift, which they named Te Toi o Takuahai, My Heavenly Fireplace.
. 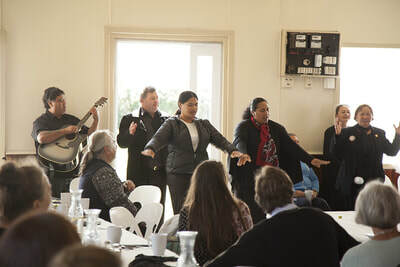 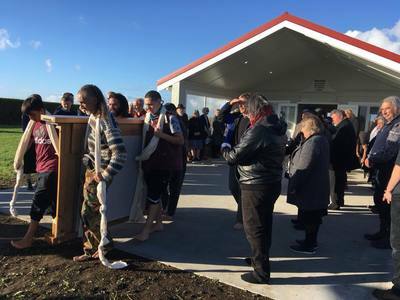 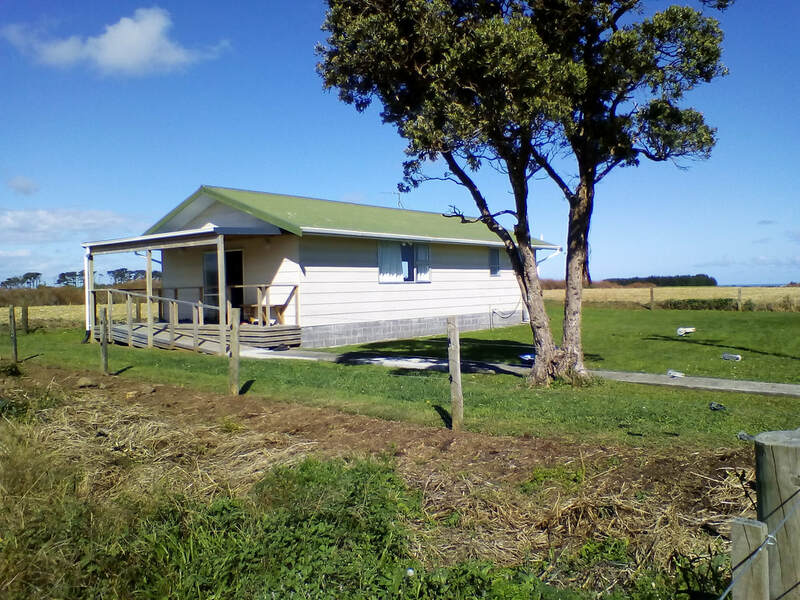 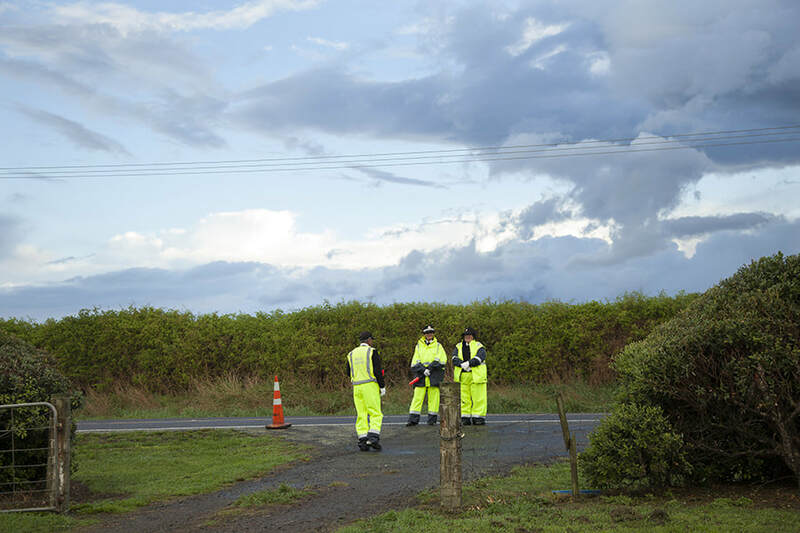 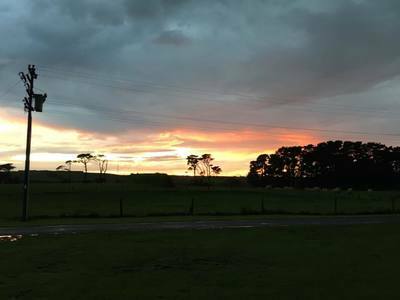 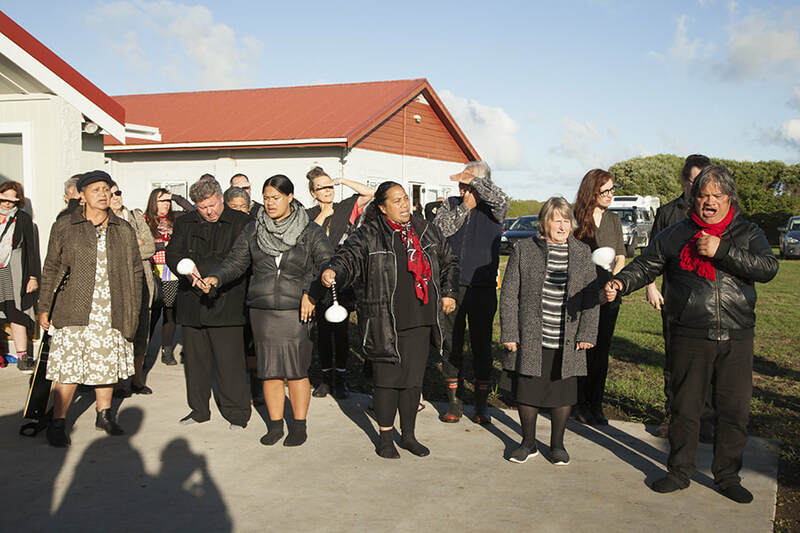 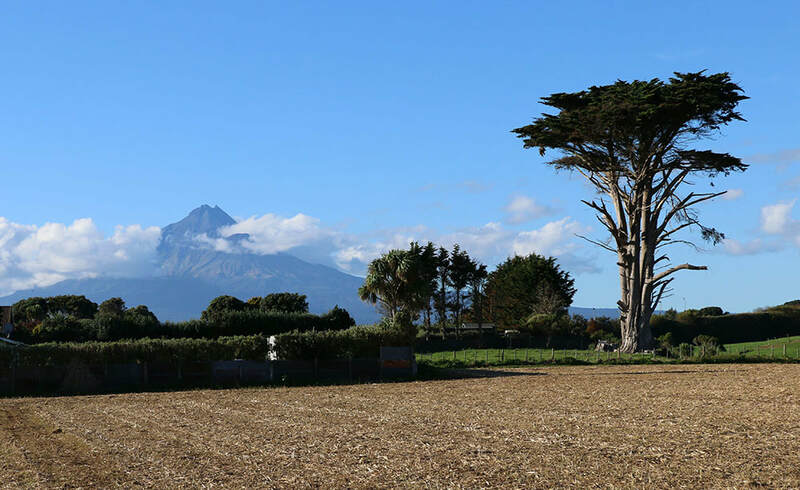 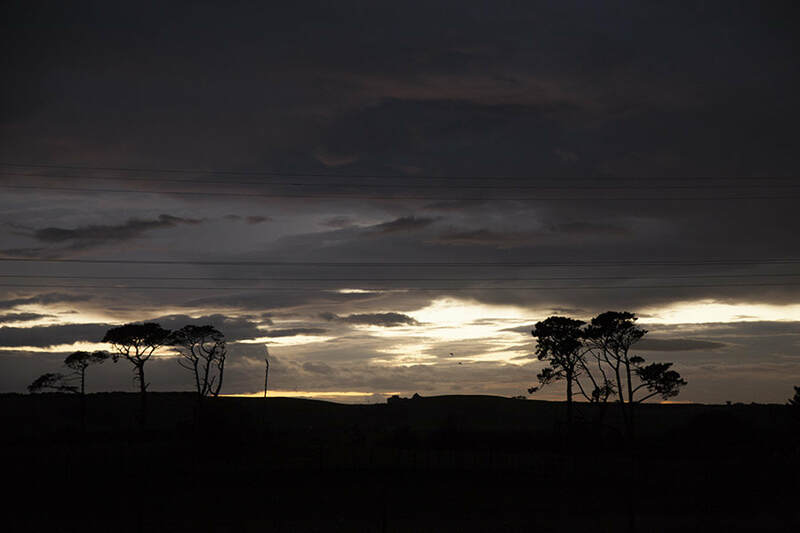 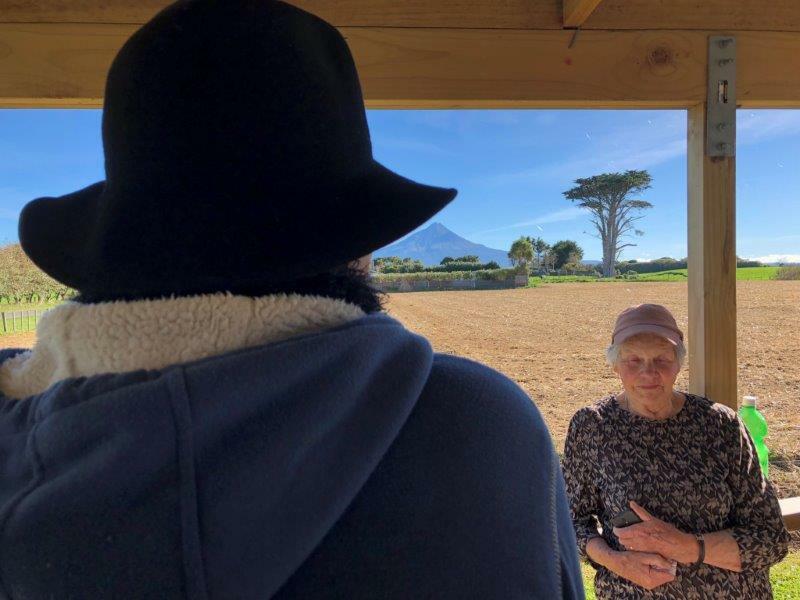 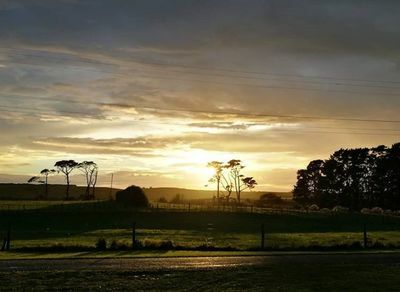 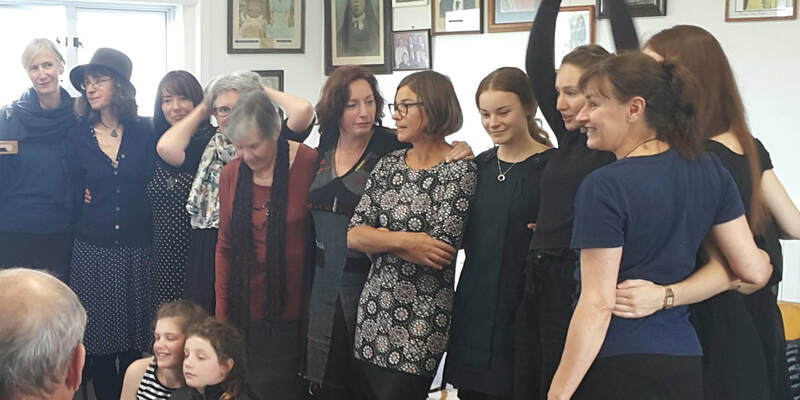 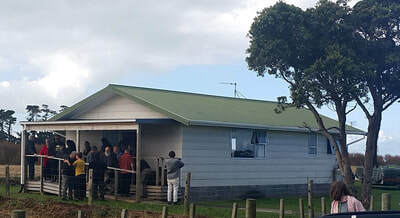 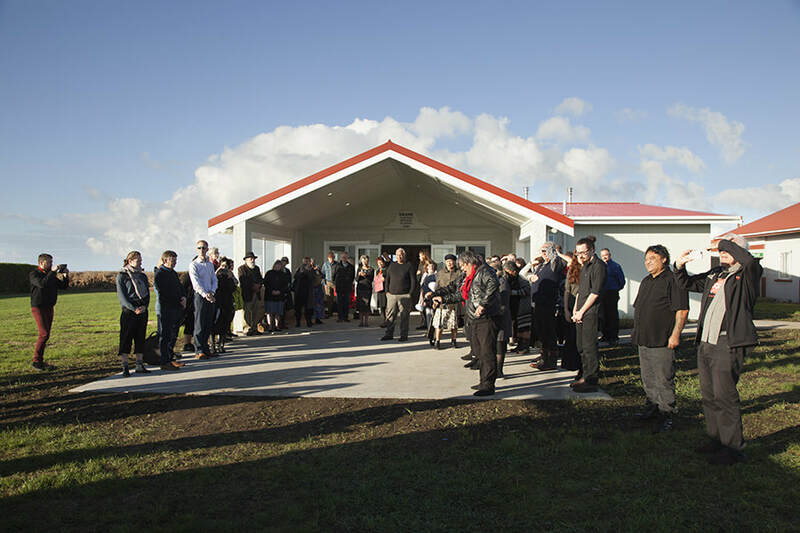 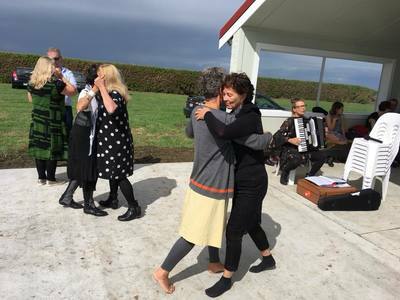 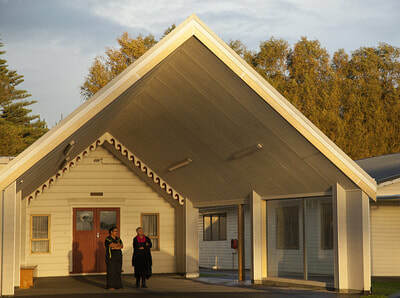 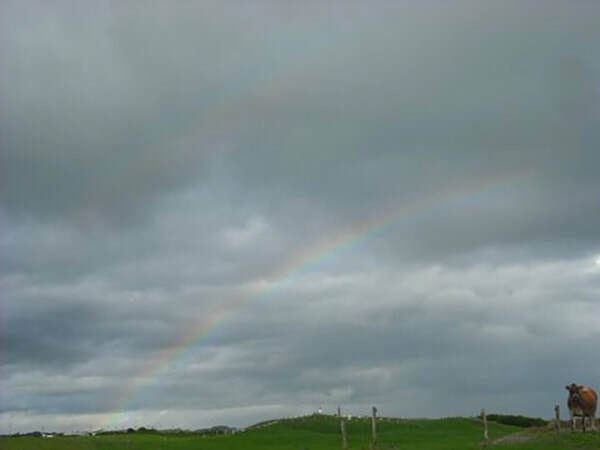 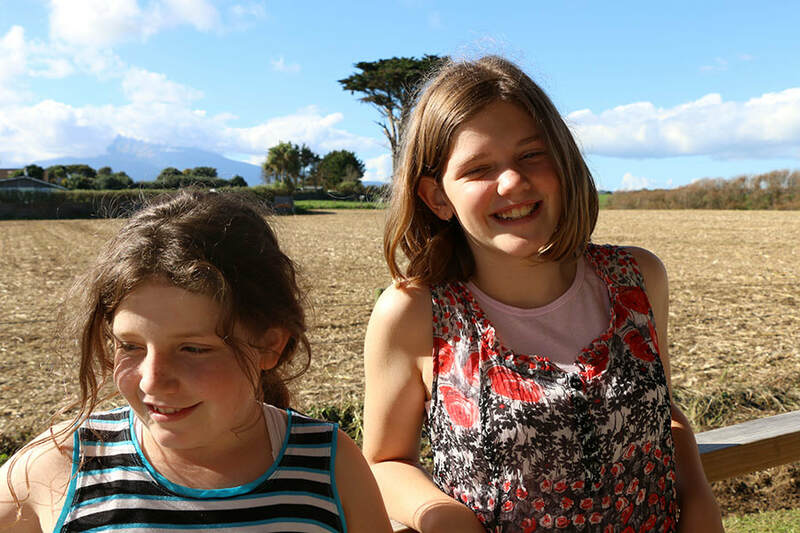 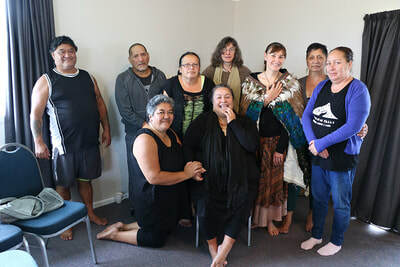 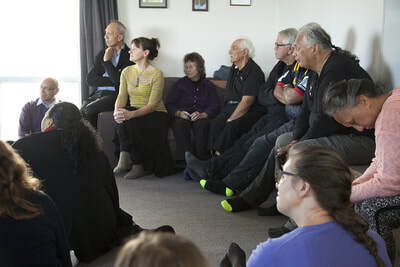 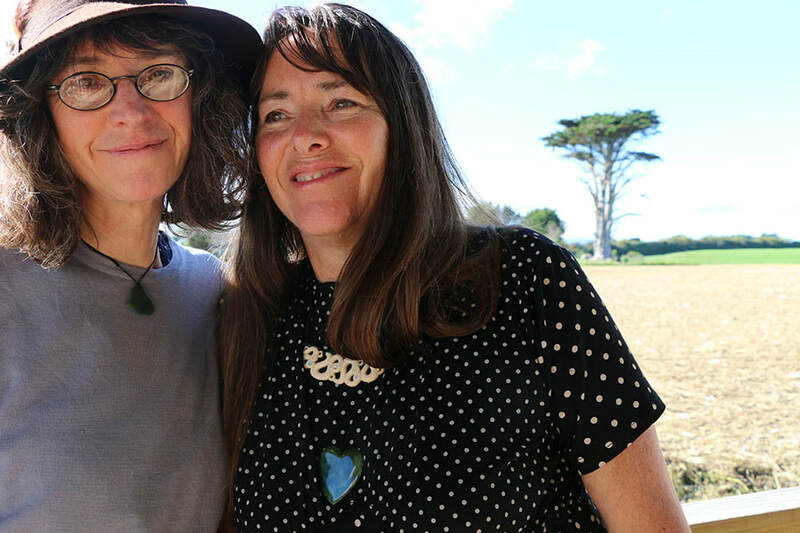 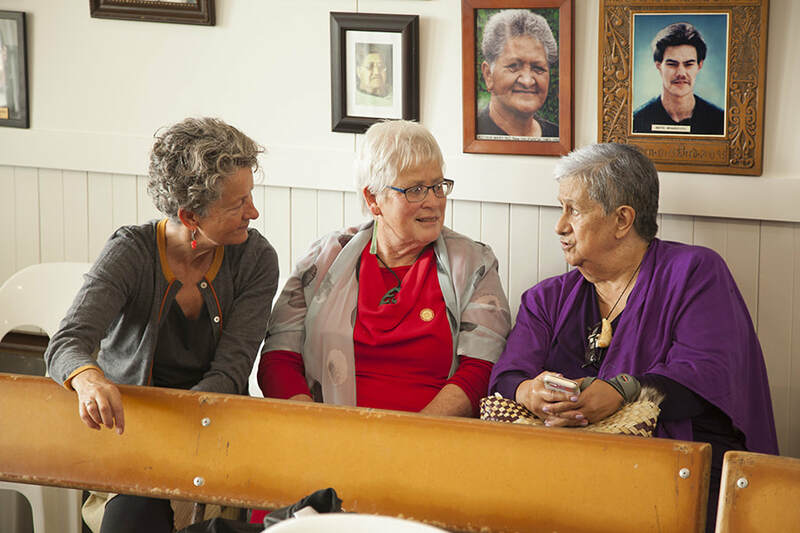 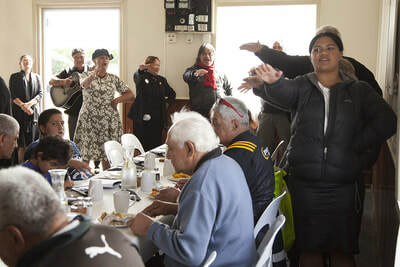 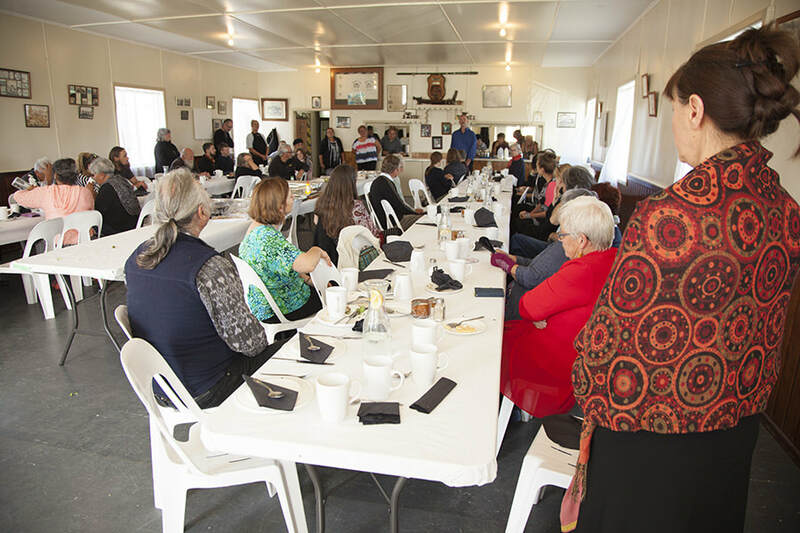 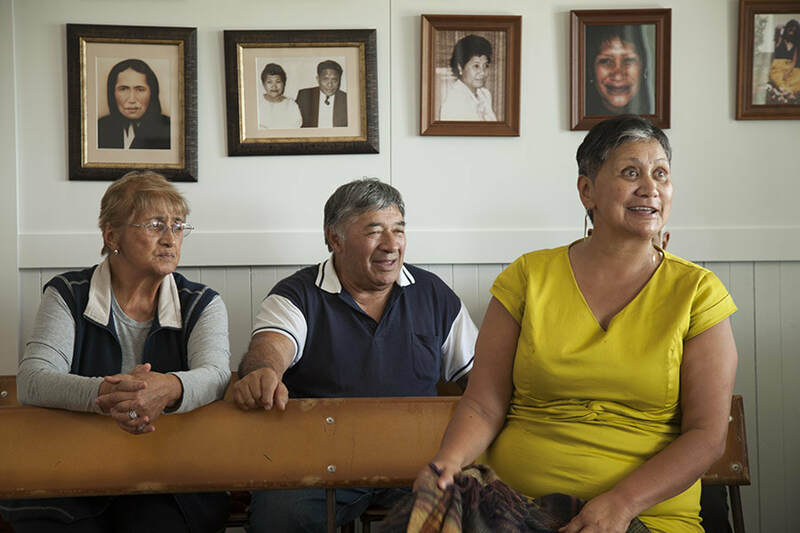 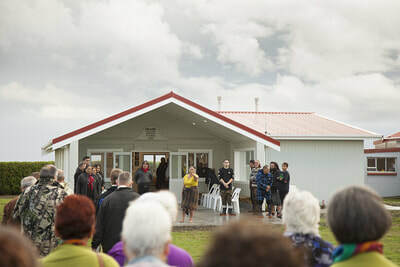 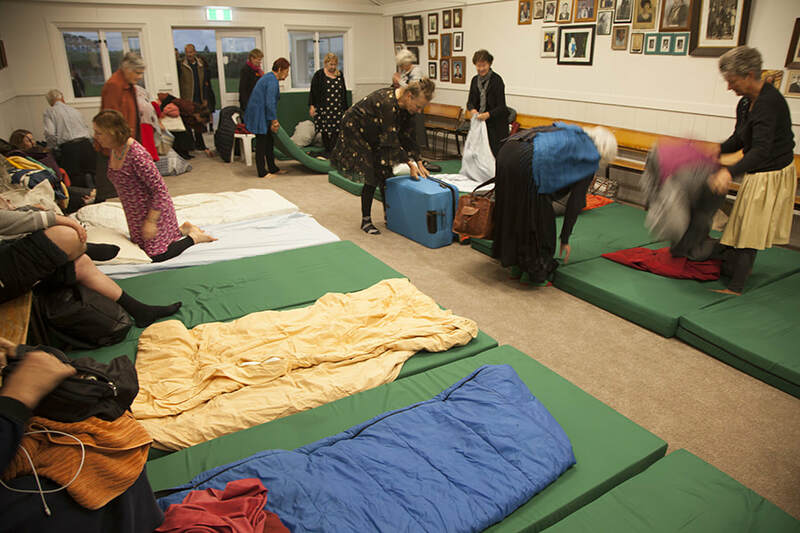 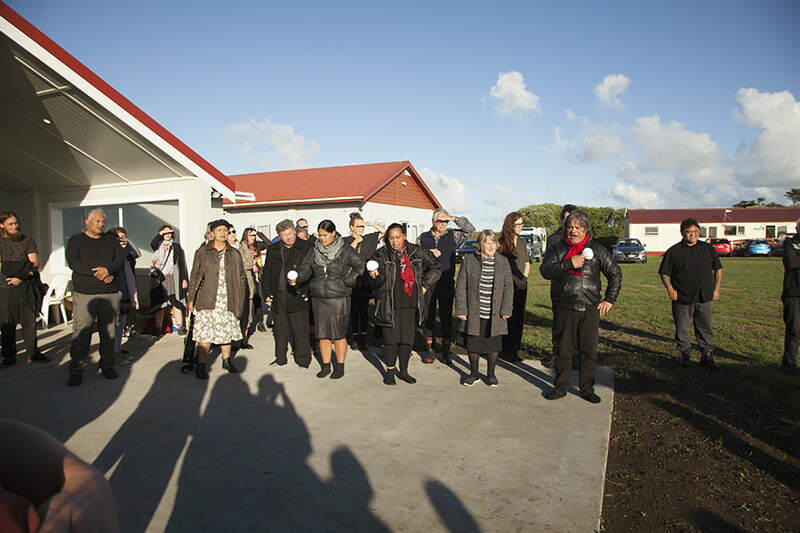 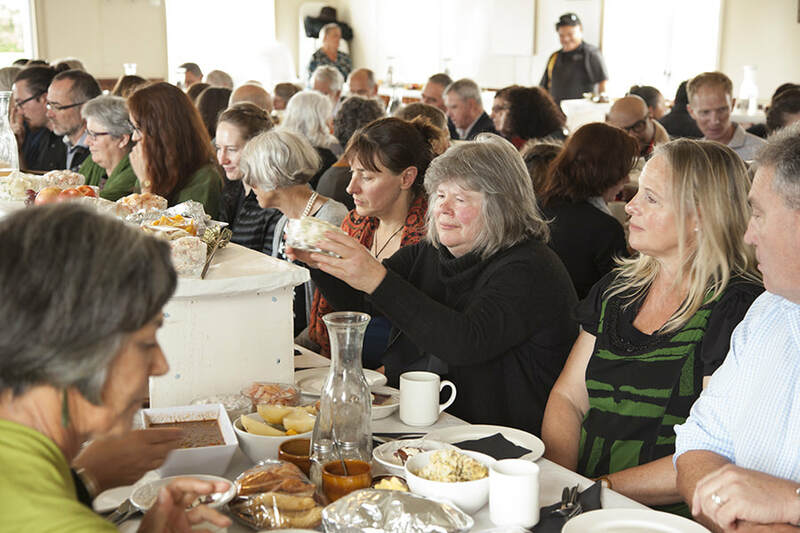 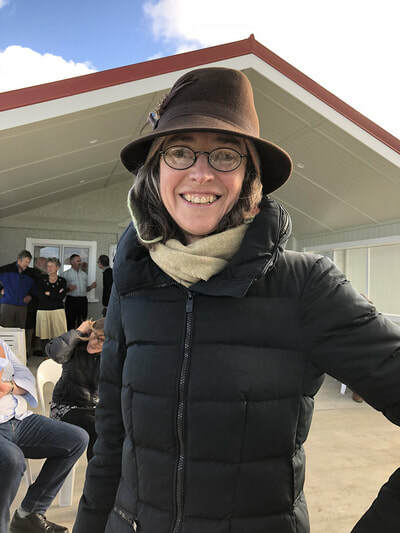 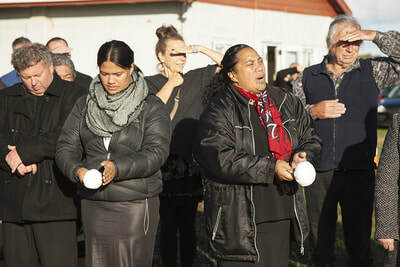 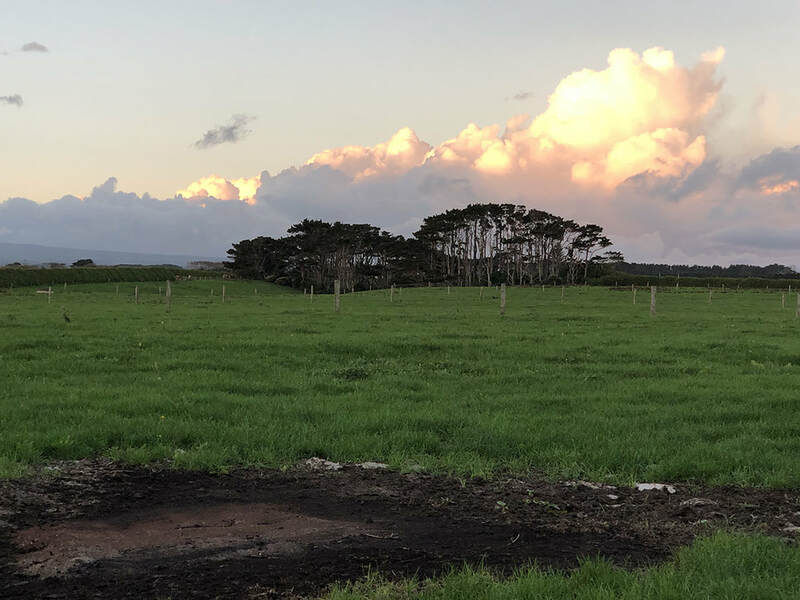 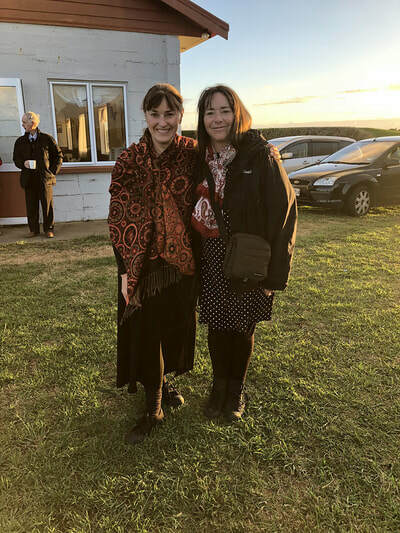 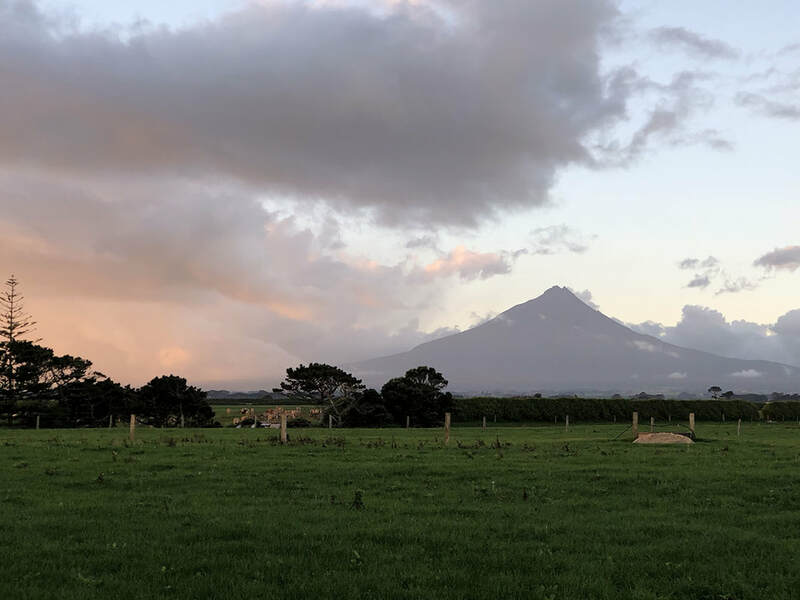 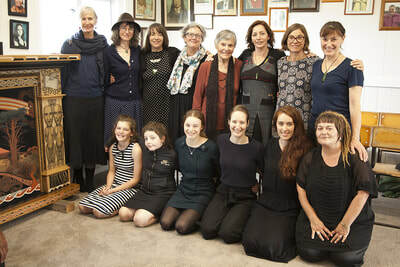 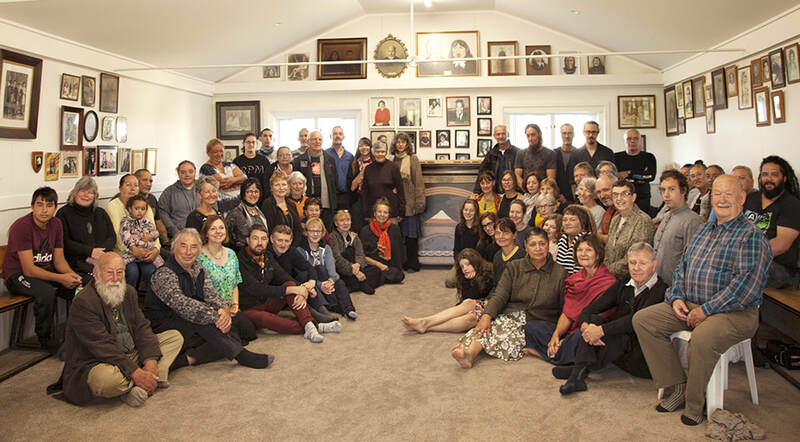 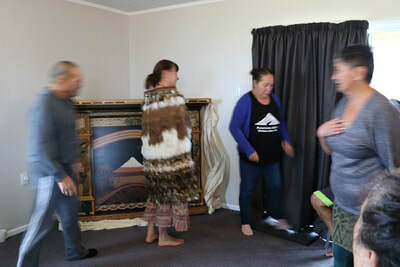 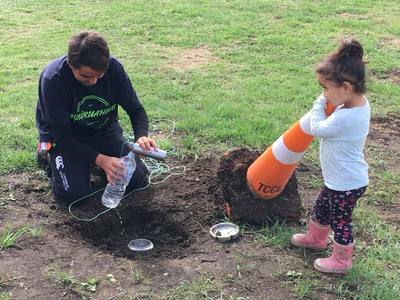 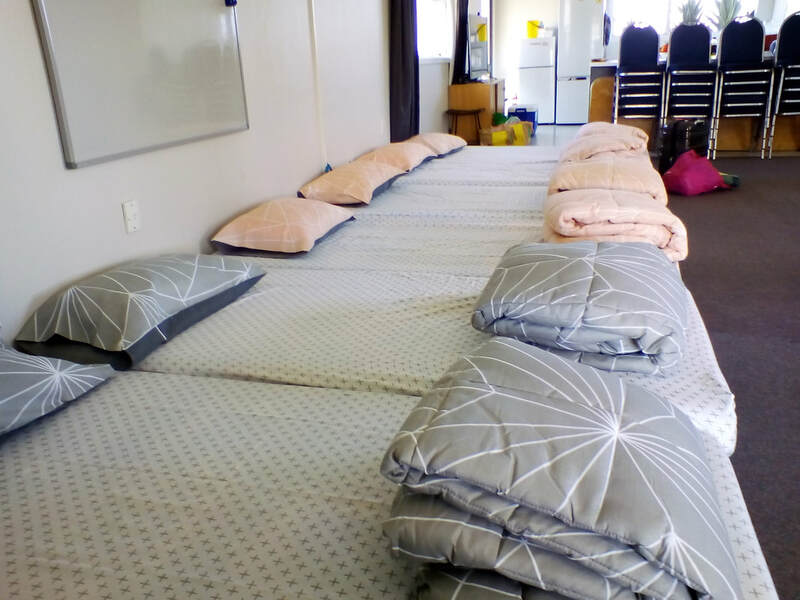 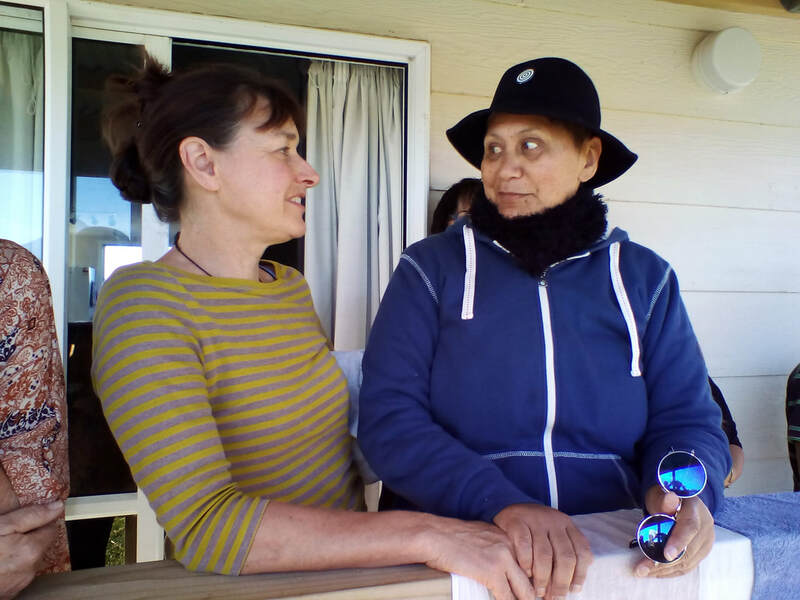 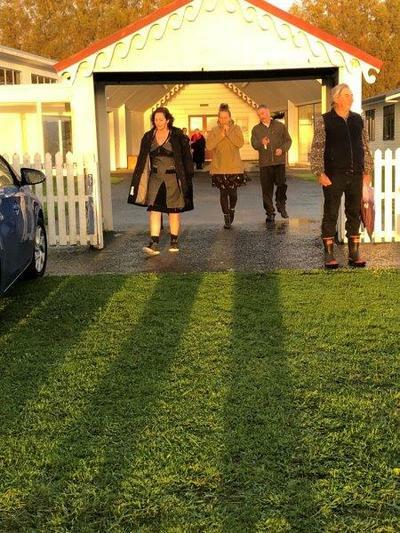 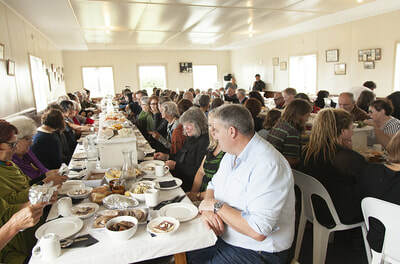 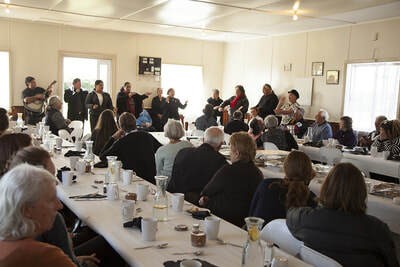 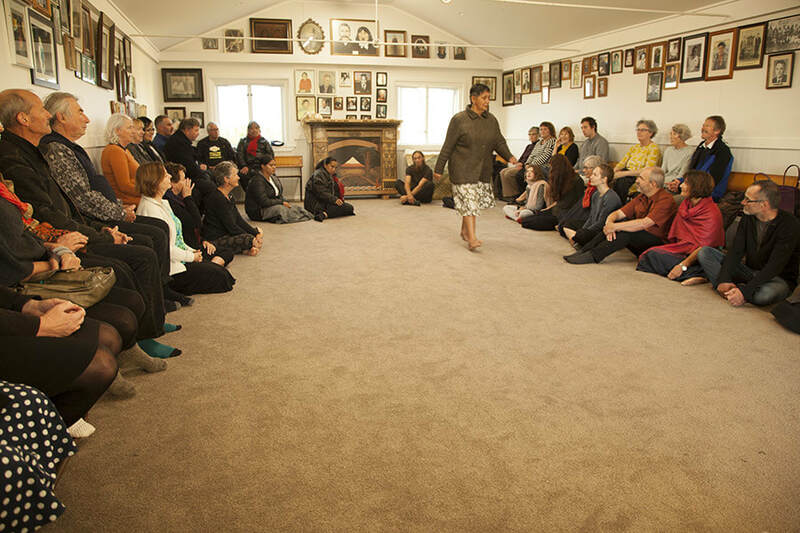 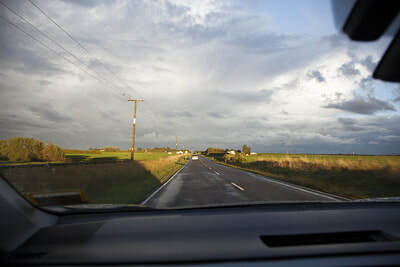 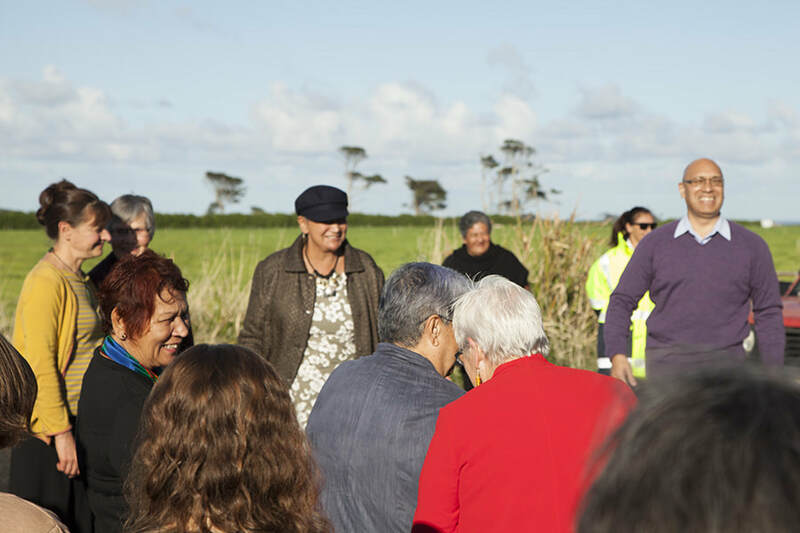 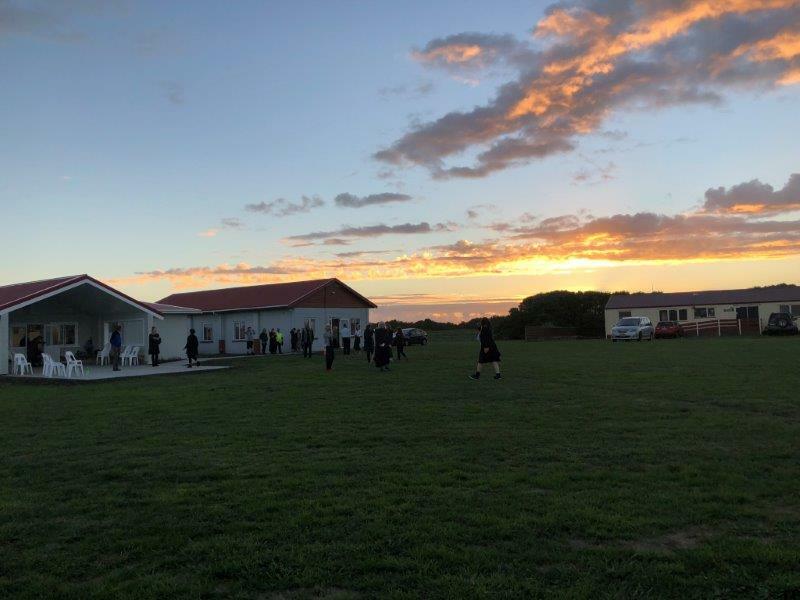 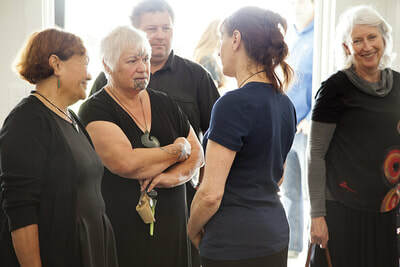 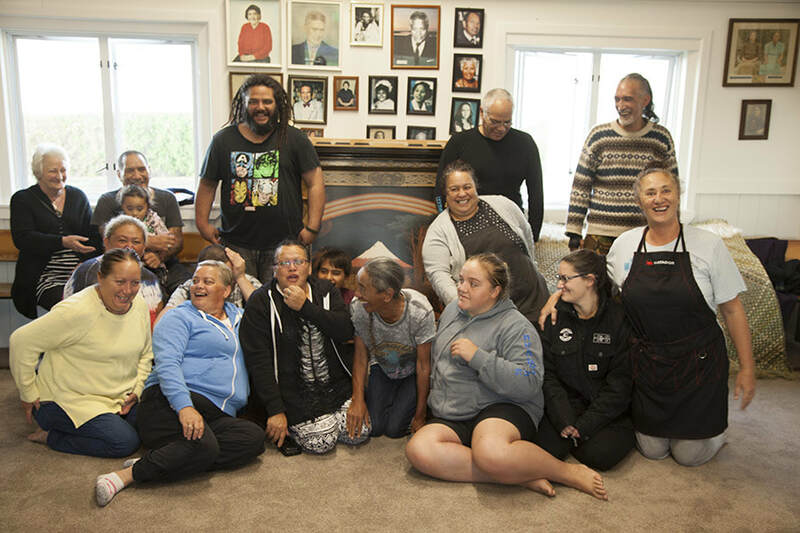 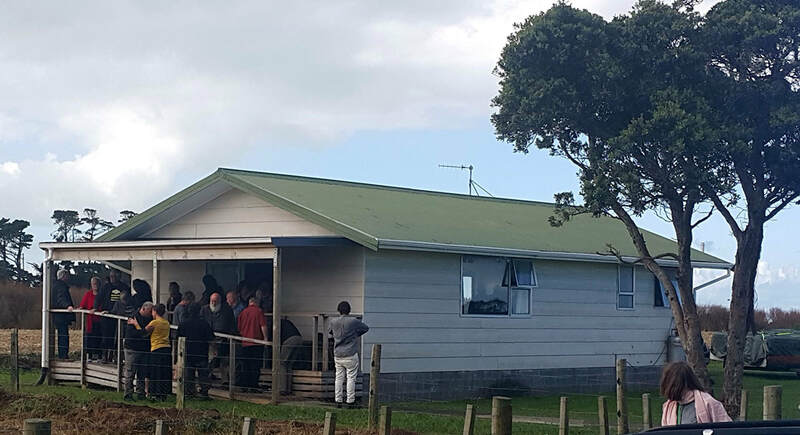 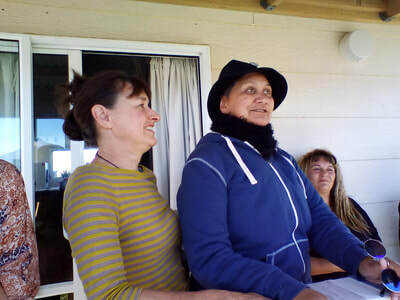 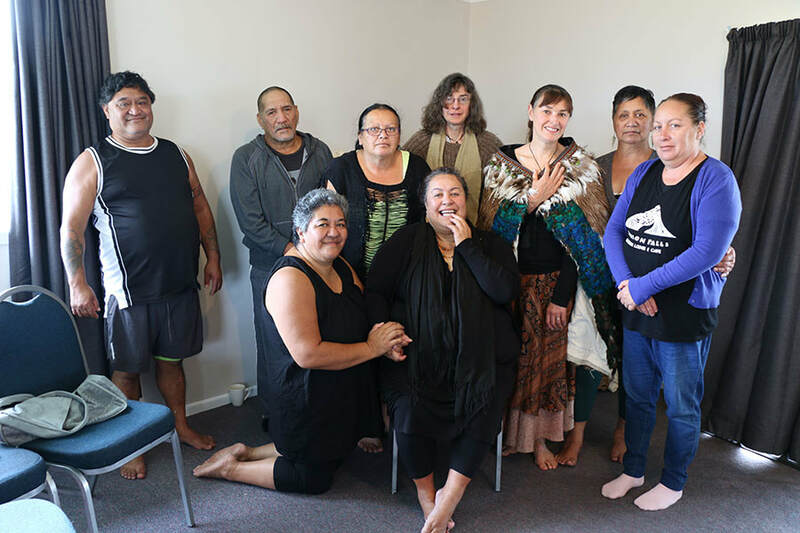 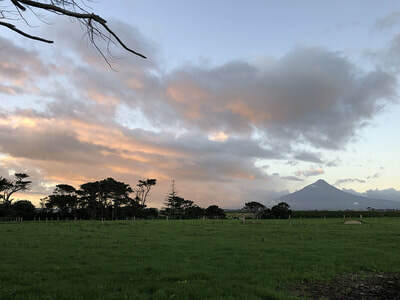 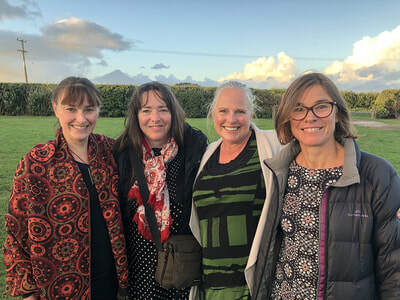 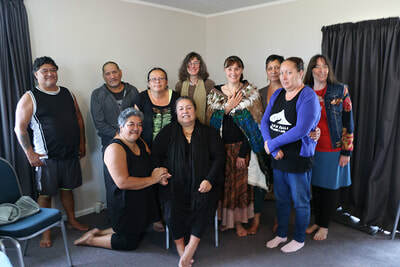 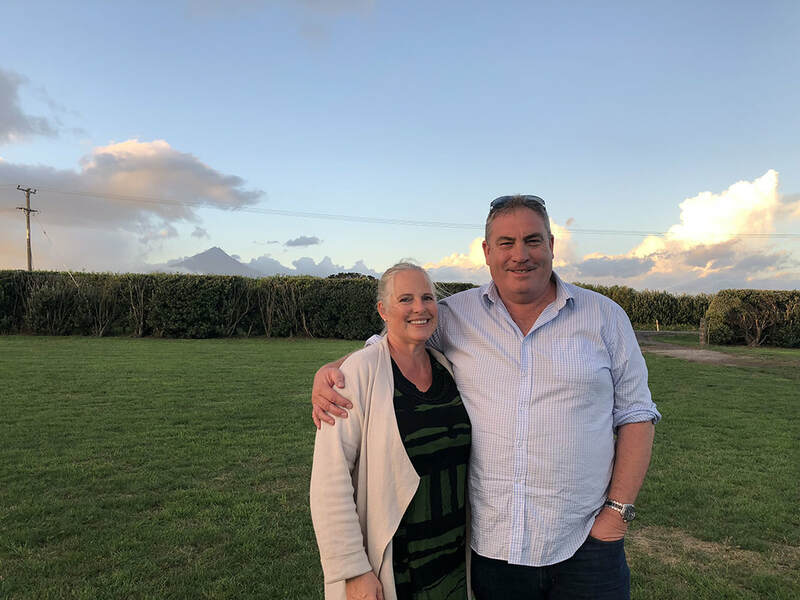 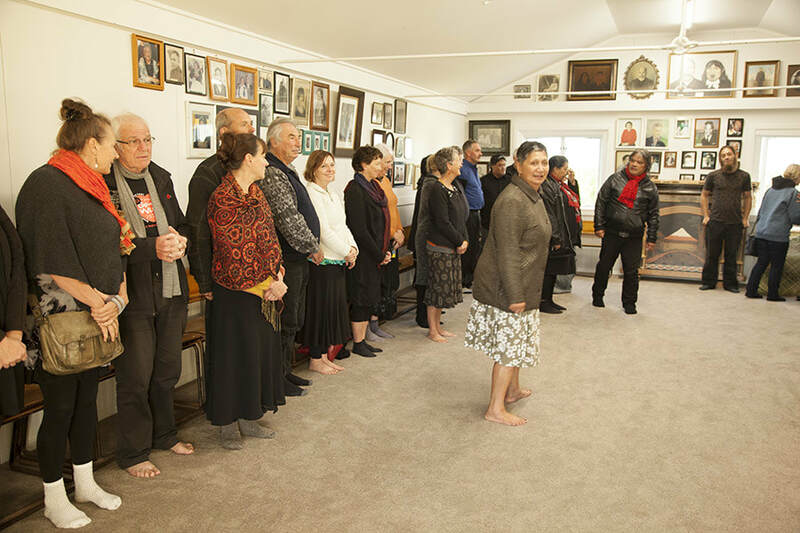 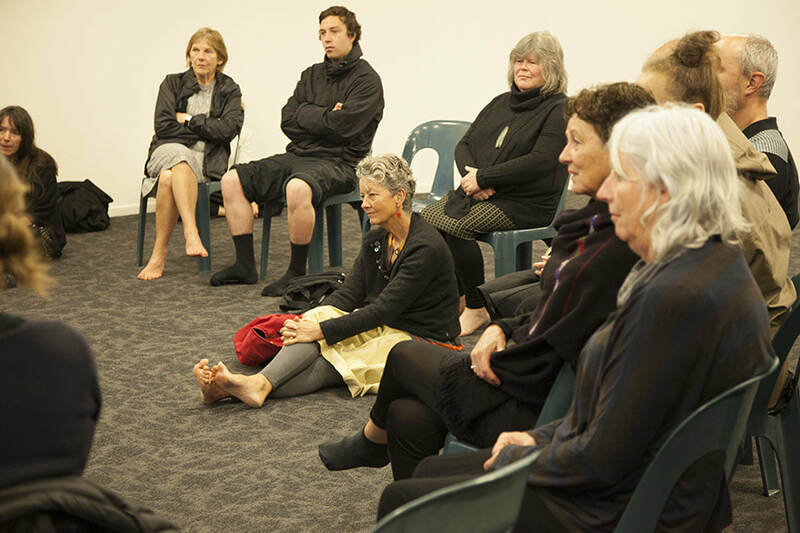 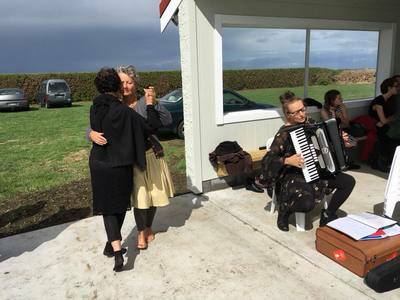 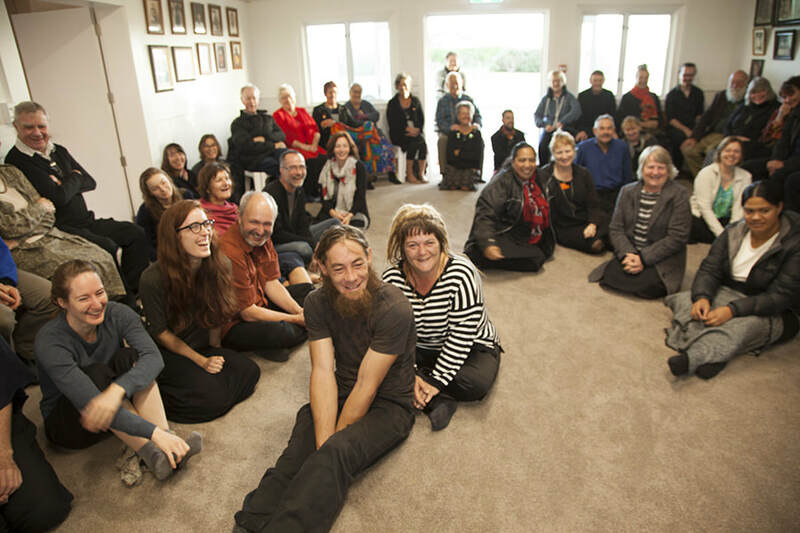 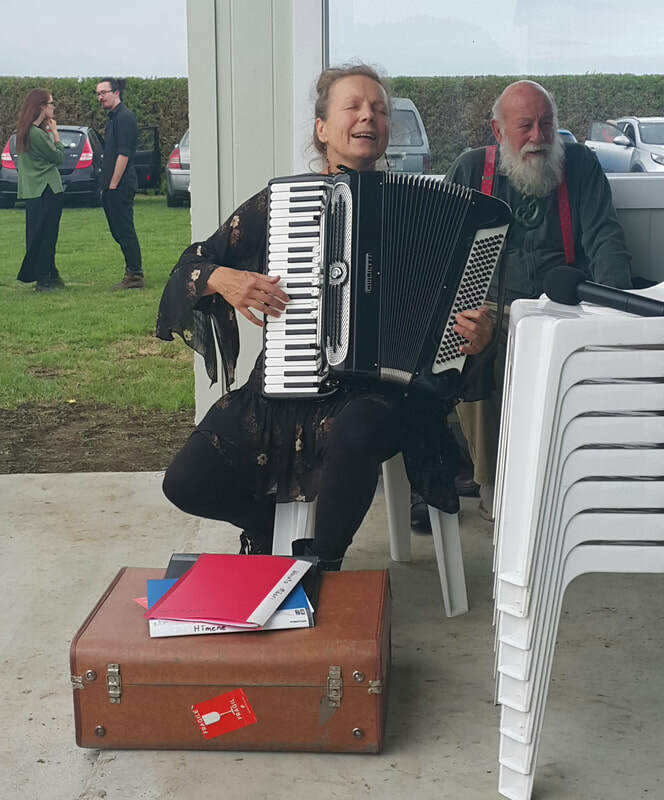 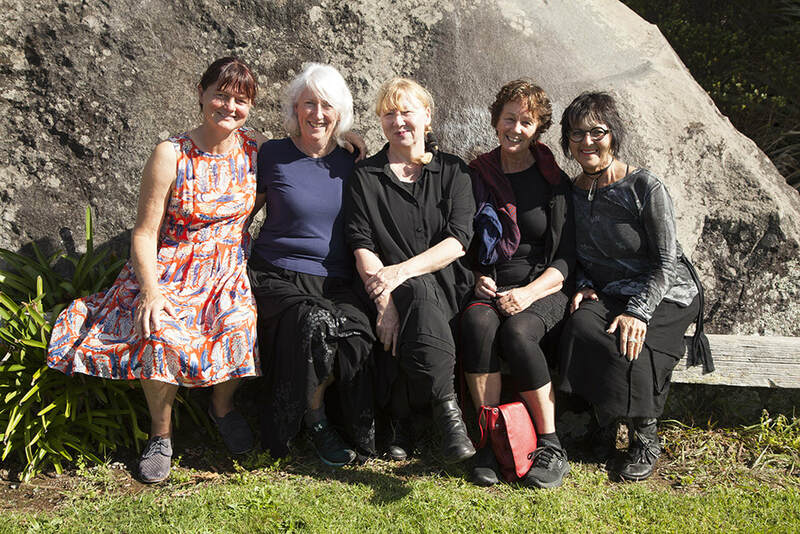 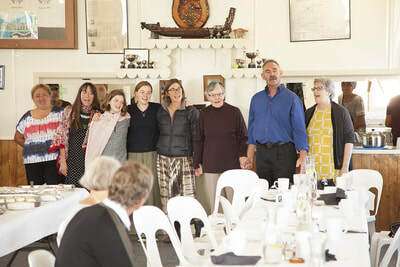 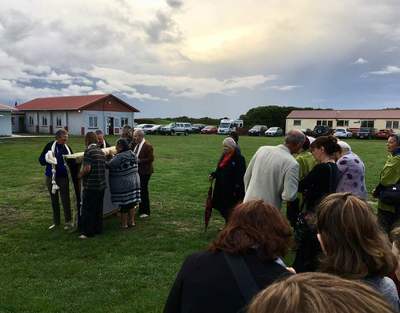 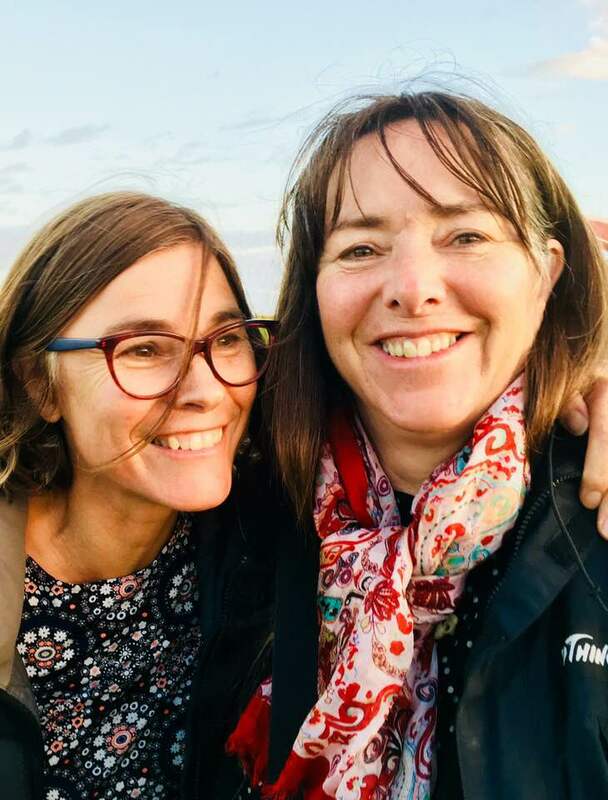 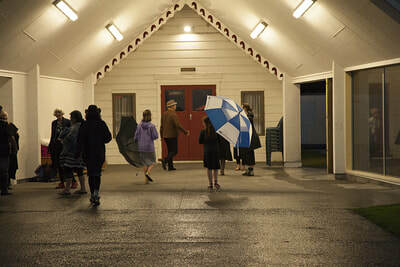 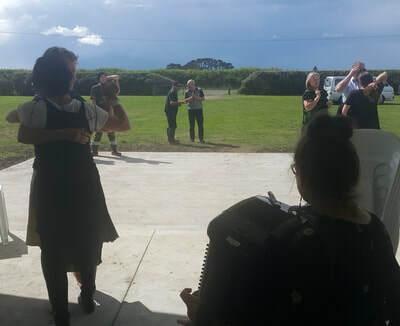 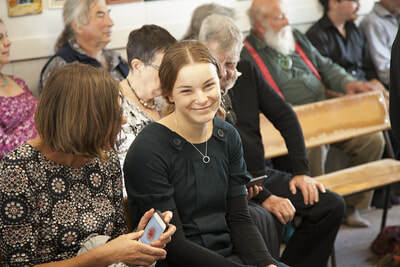 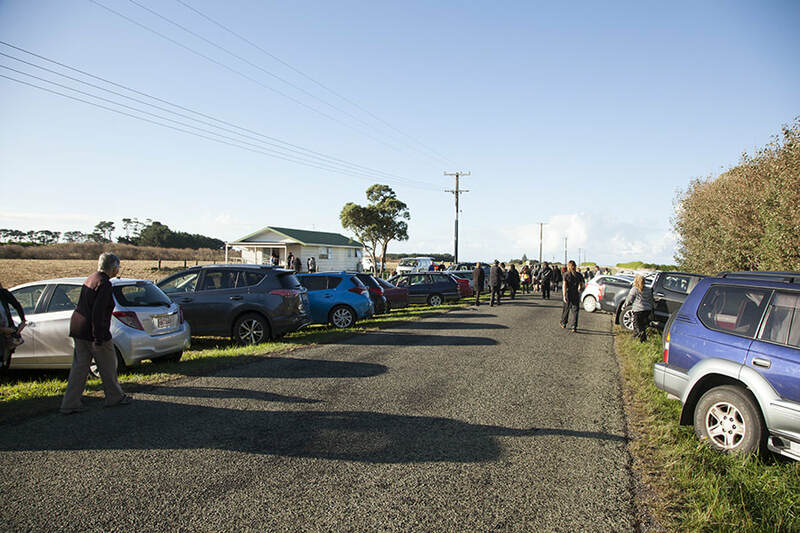 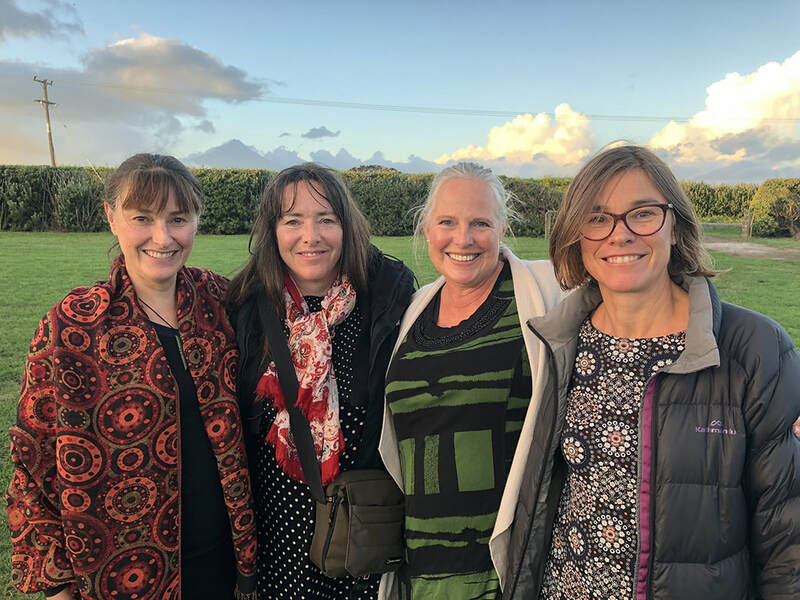 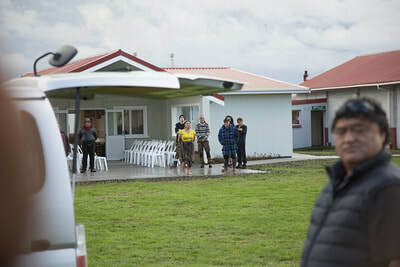 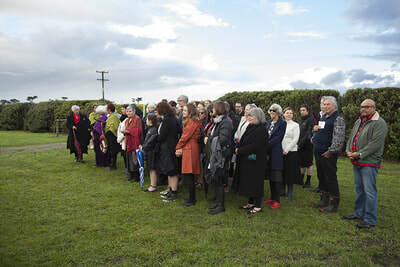 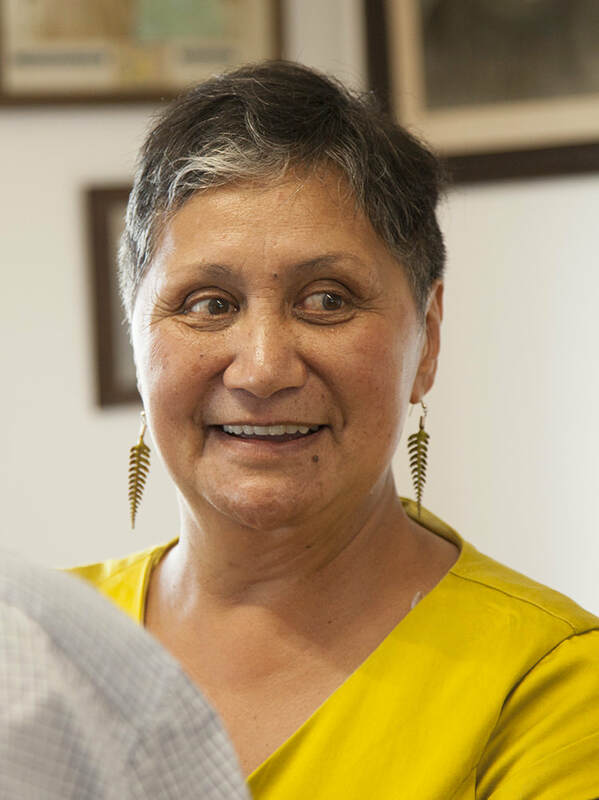 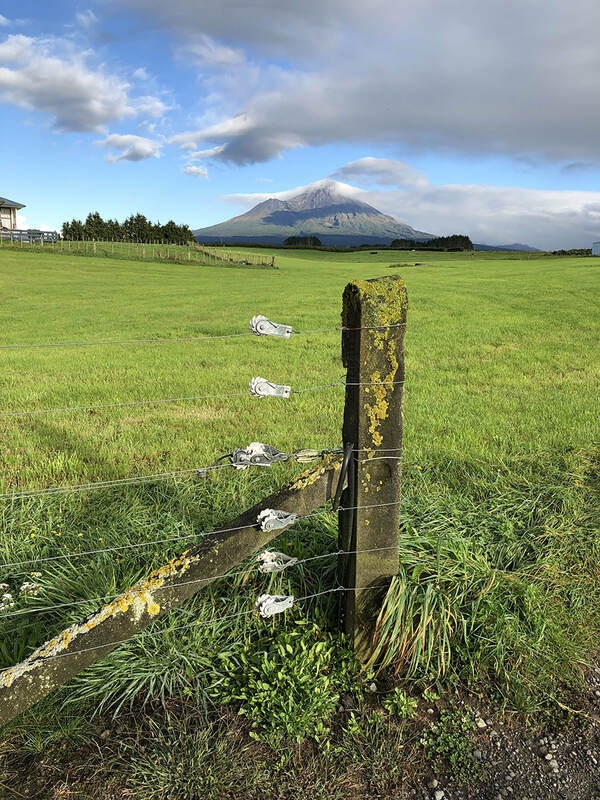 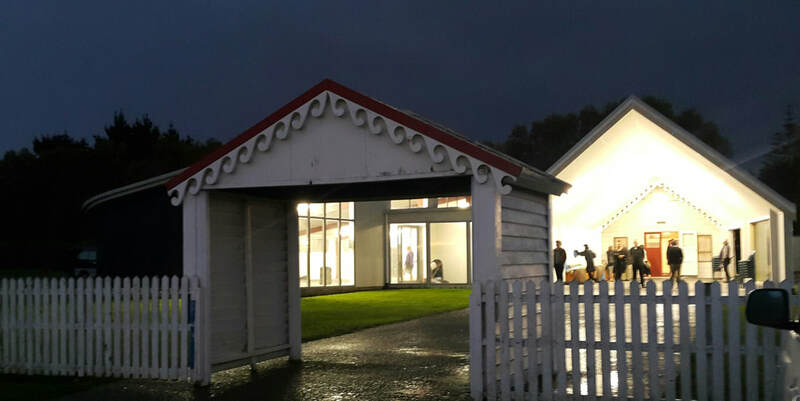 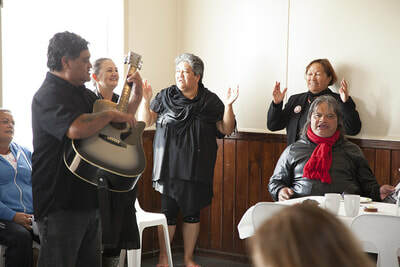 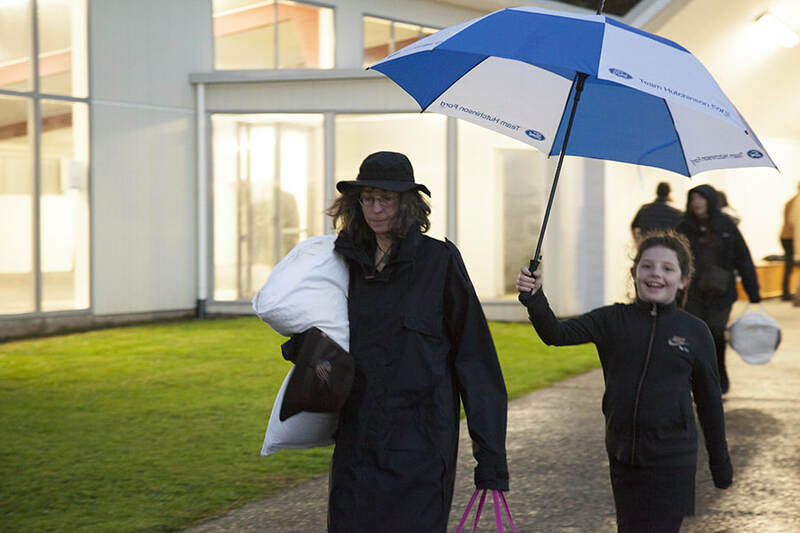 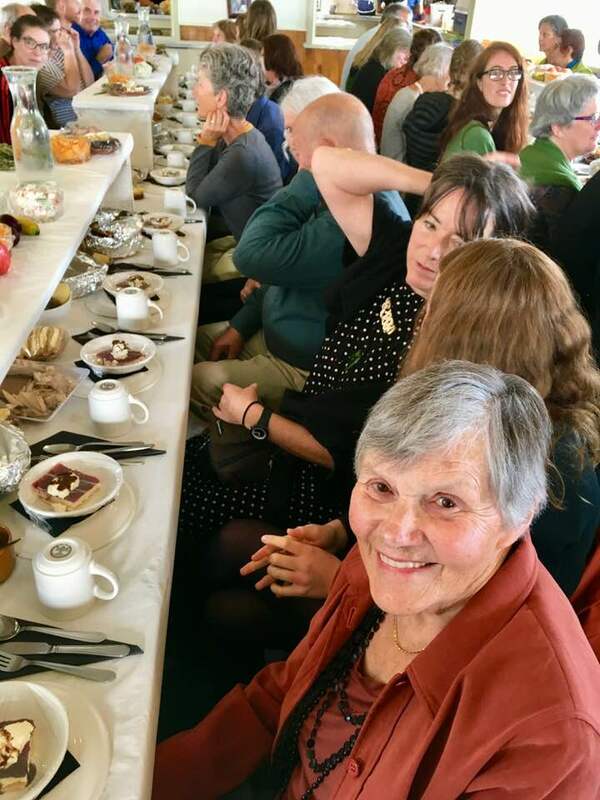 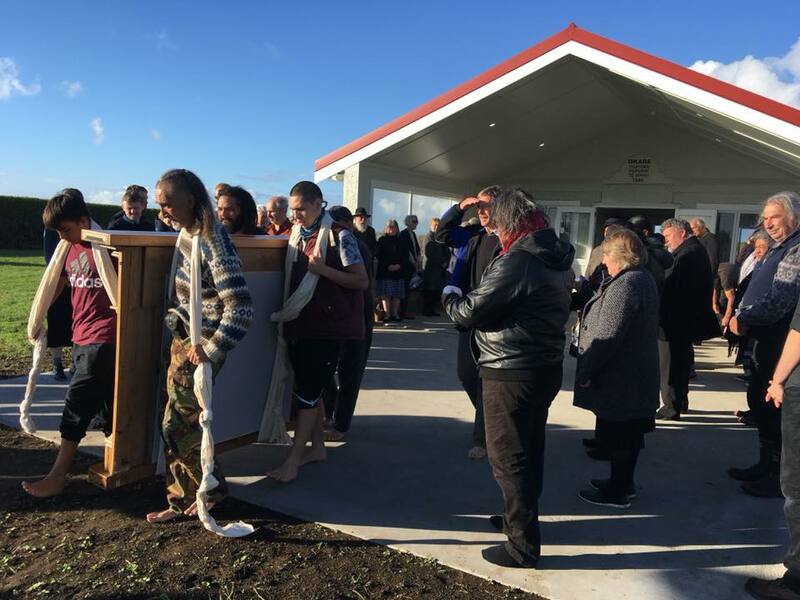 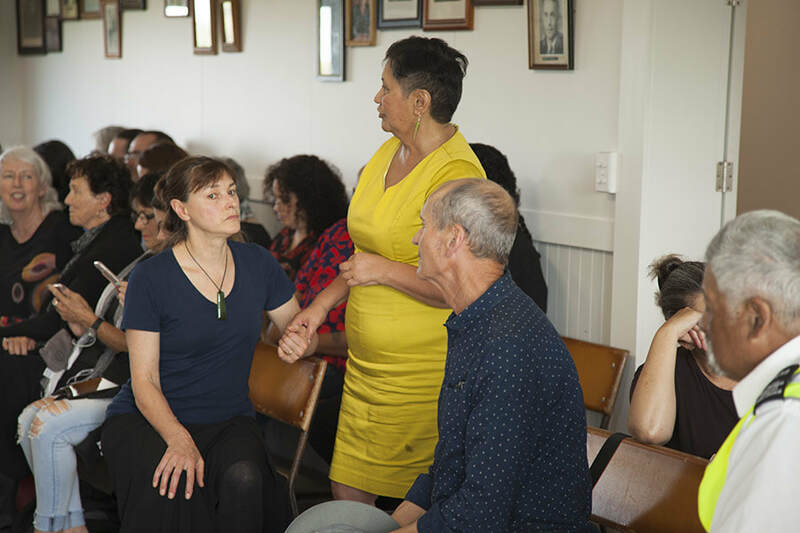 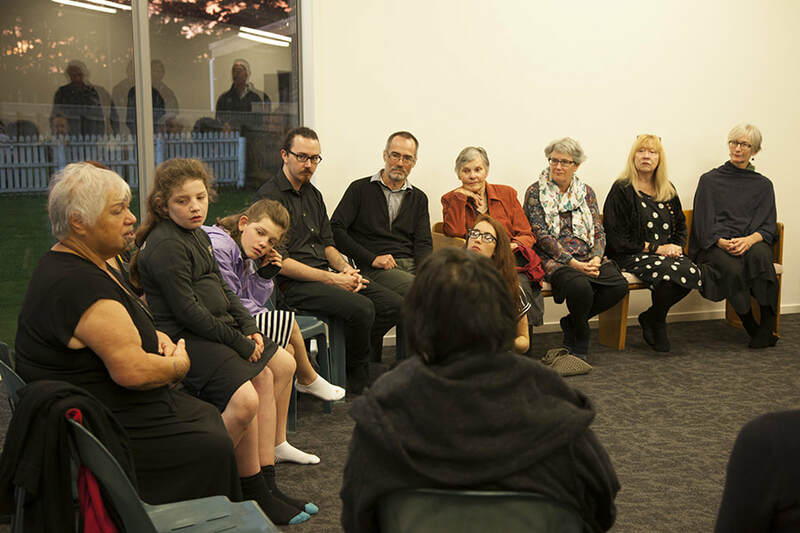 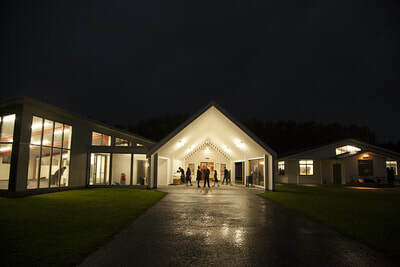 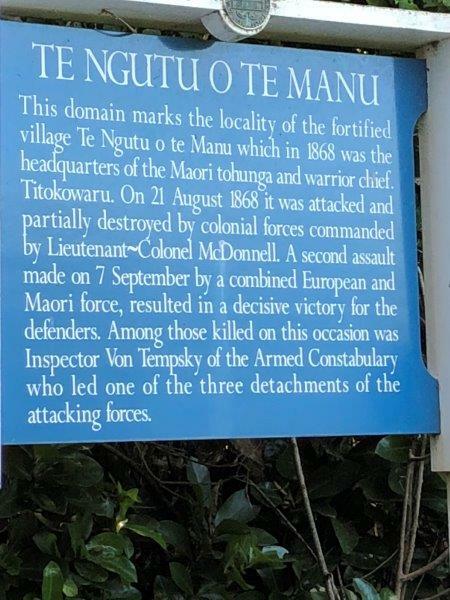 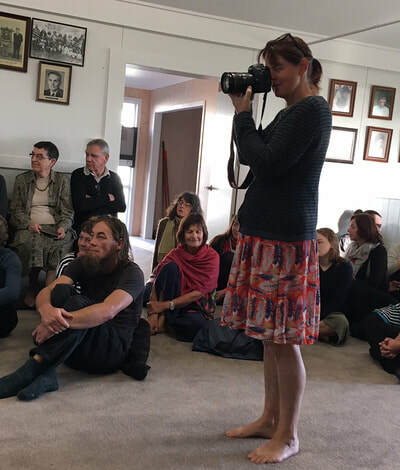 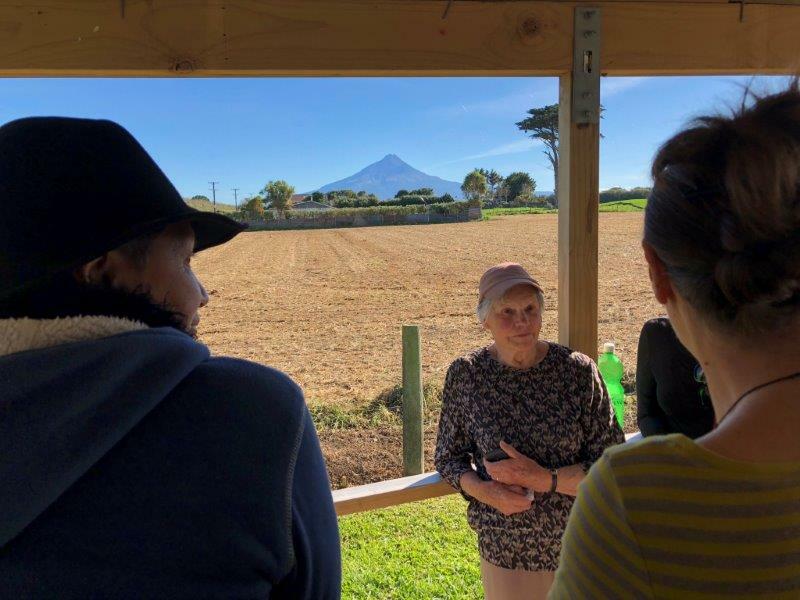 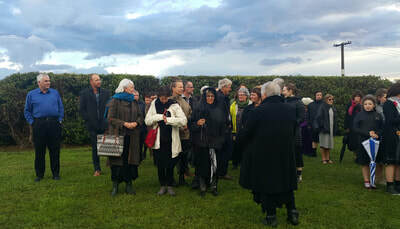 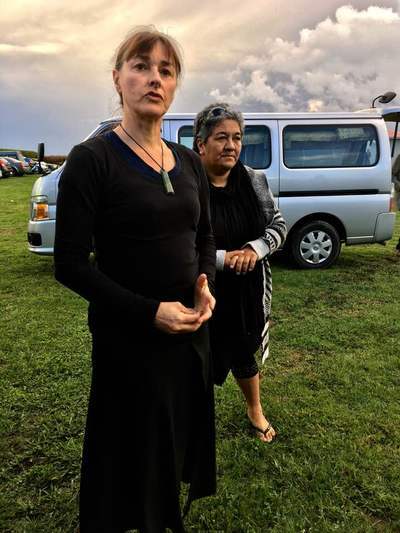 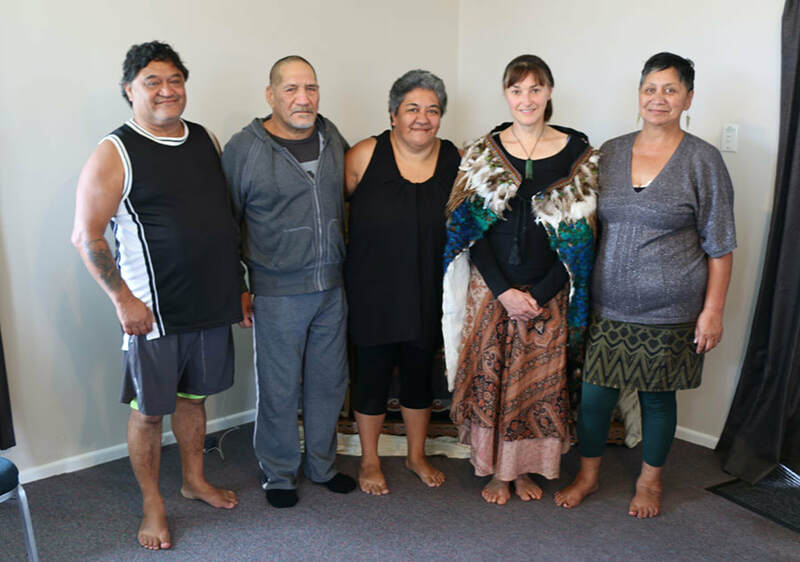 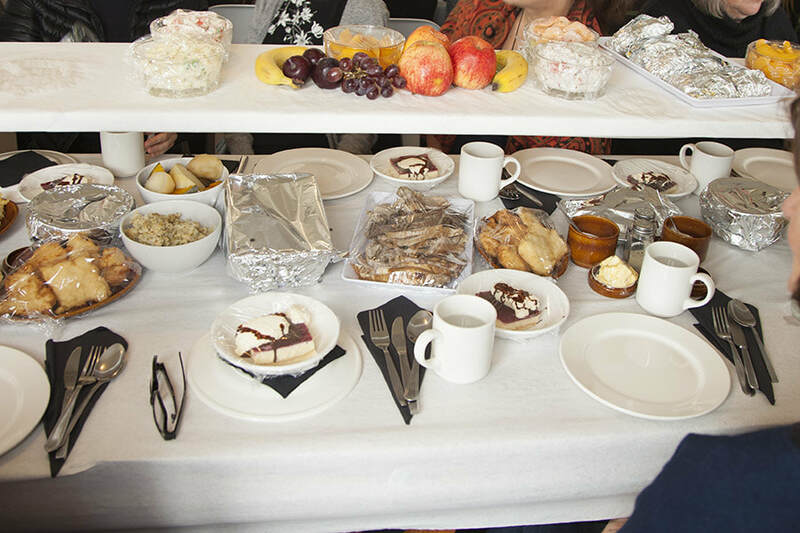 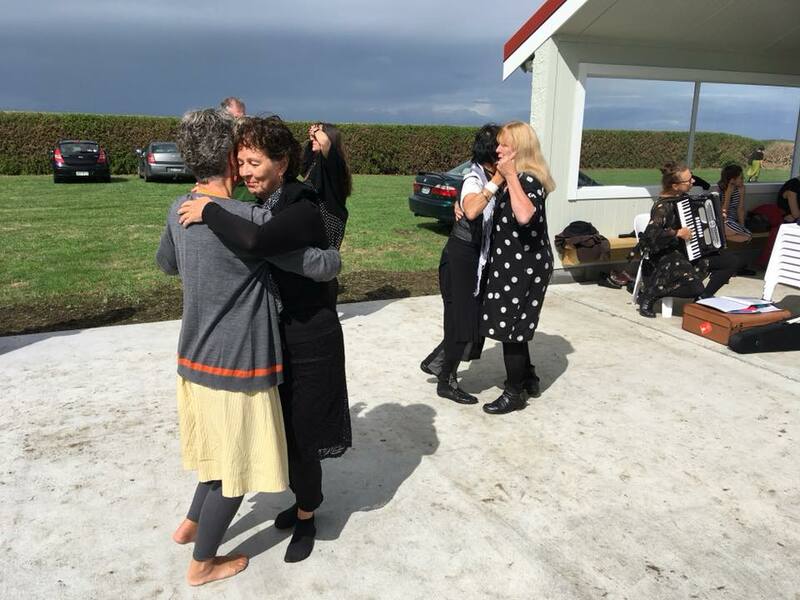 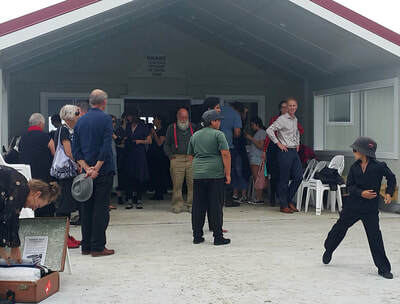 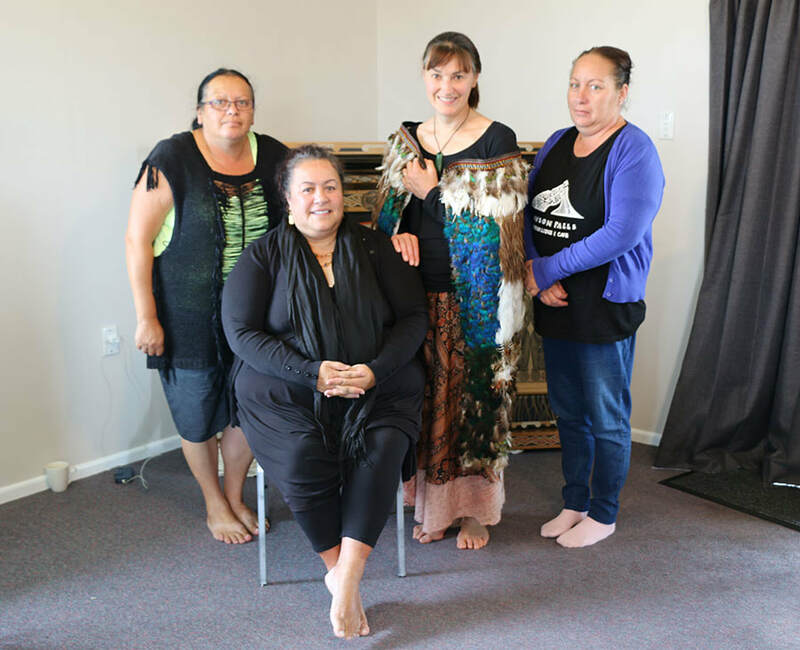 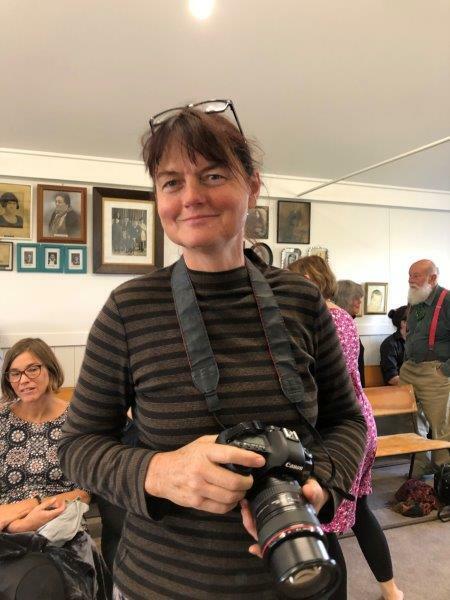 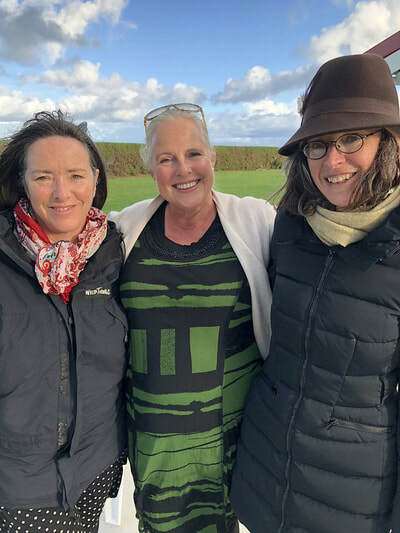 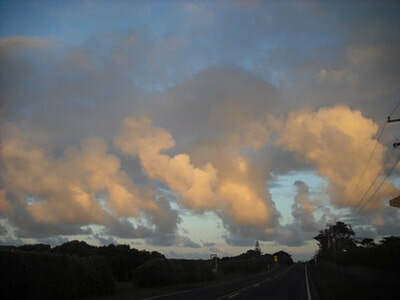 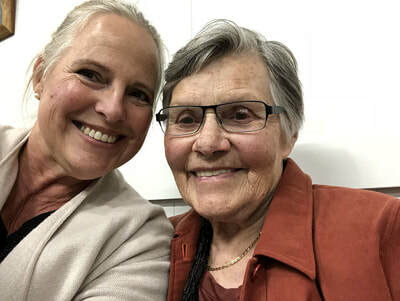 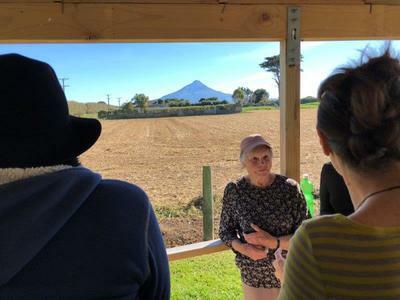 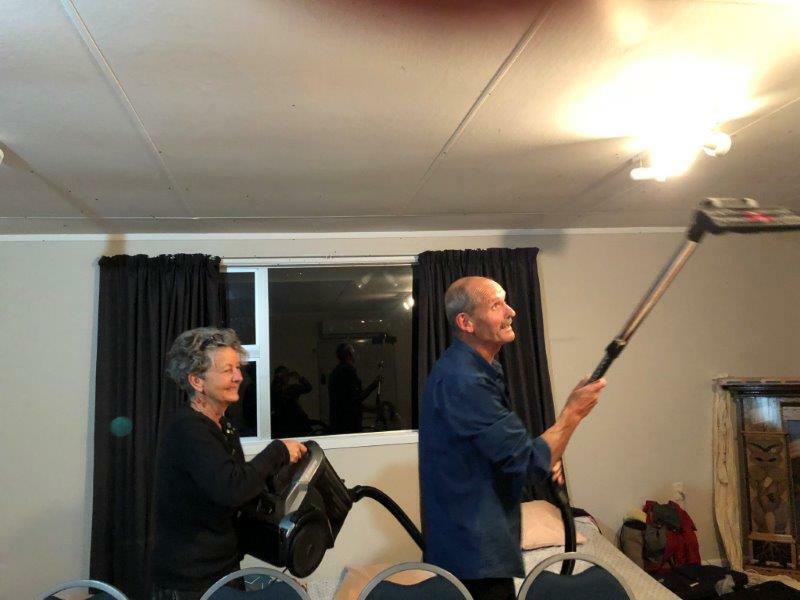 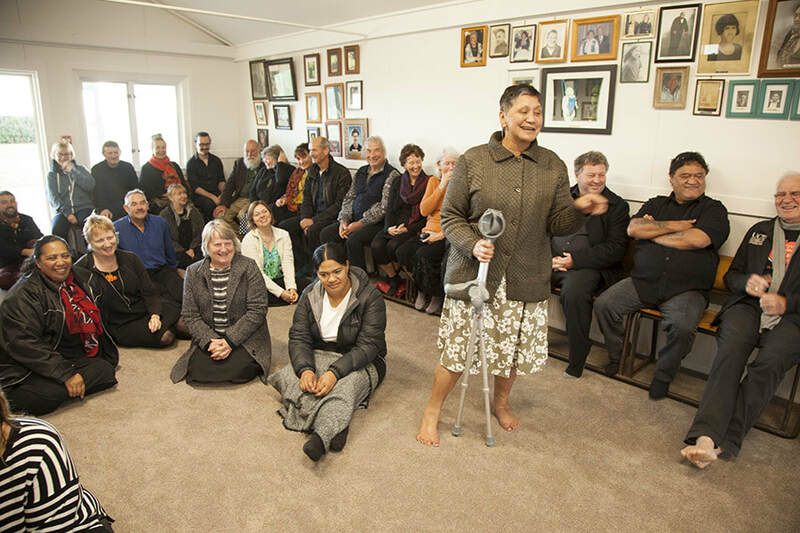 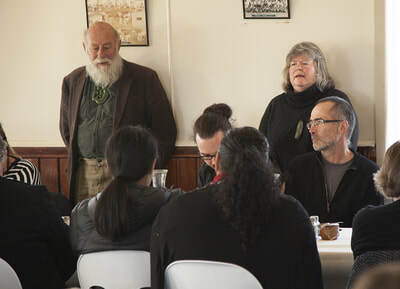 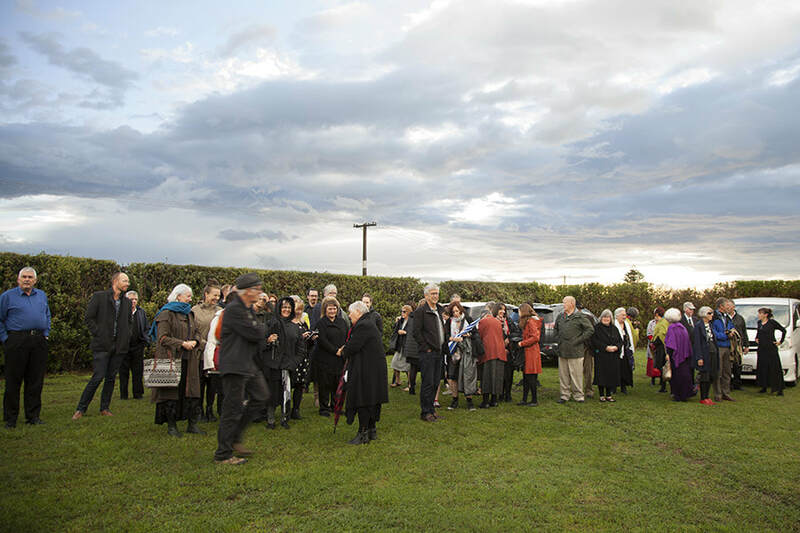 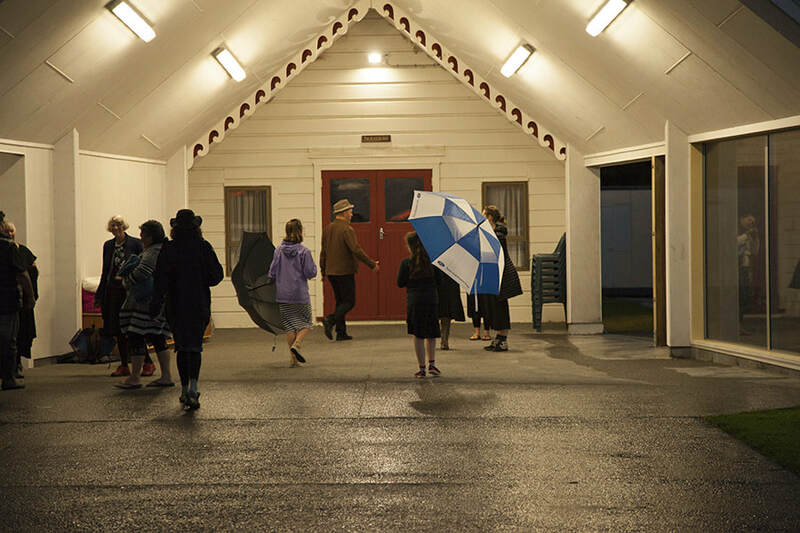 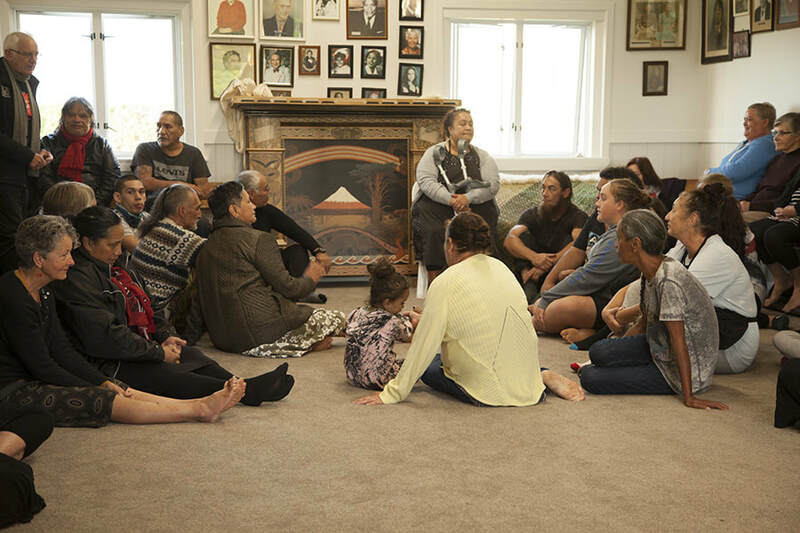 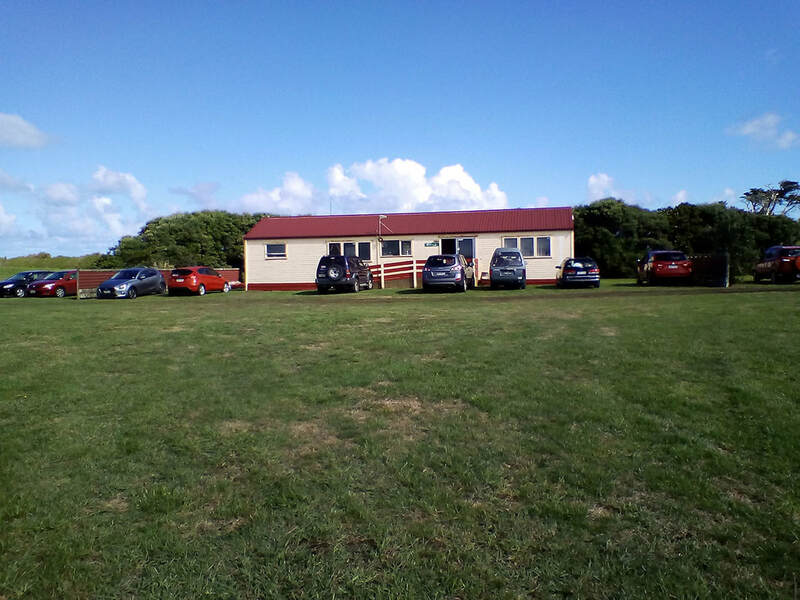 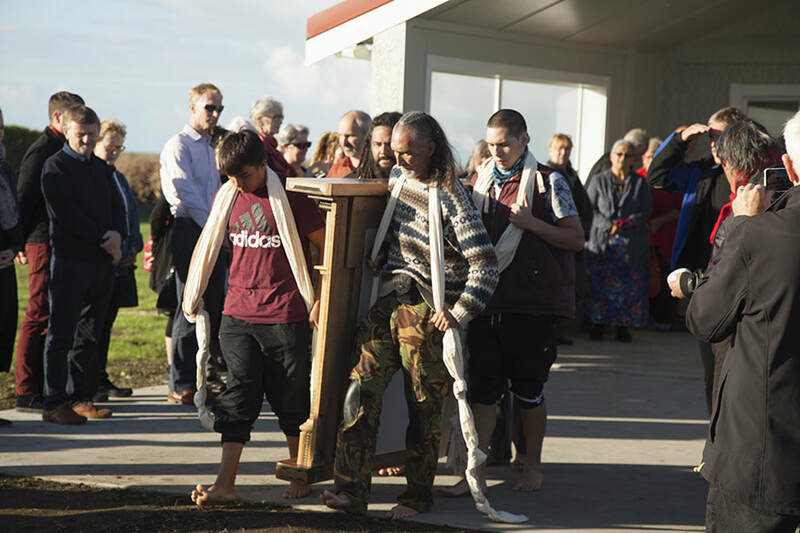 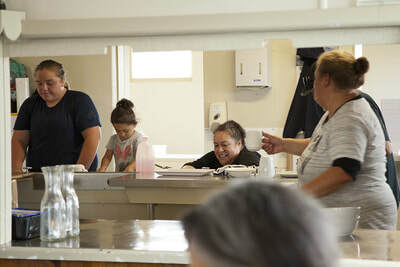 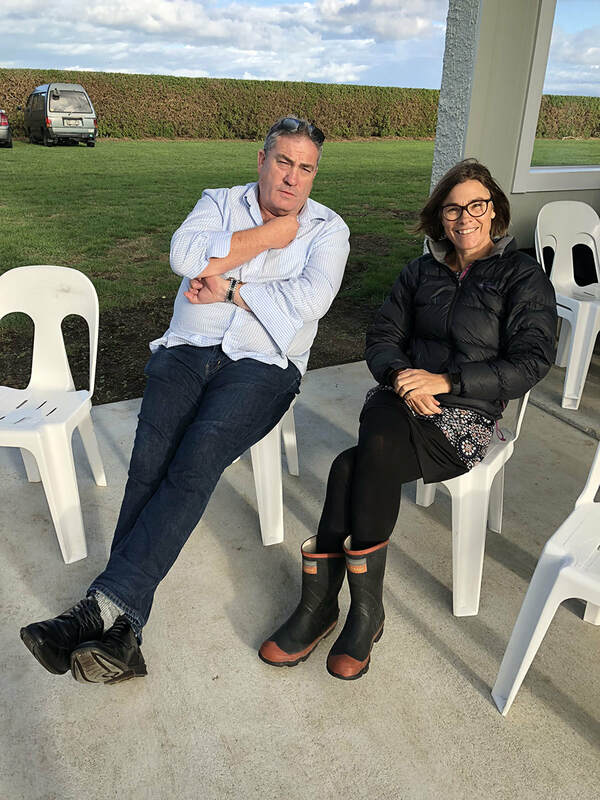 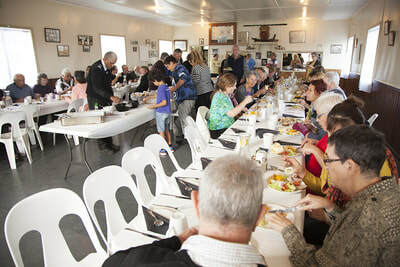 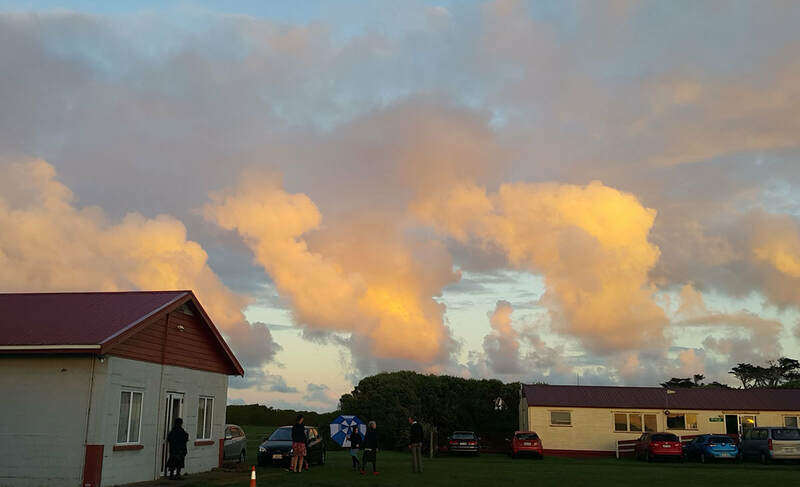 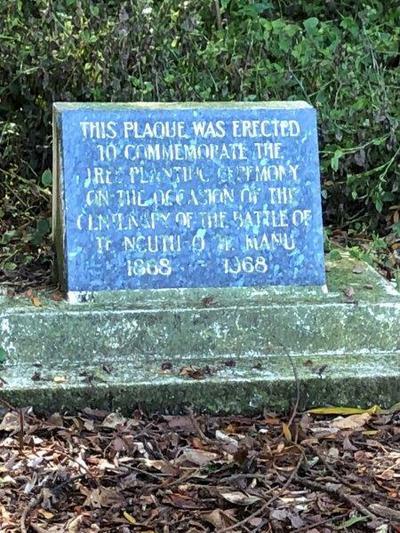 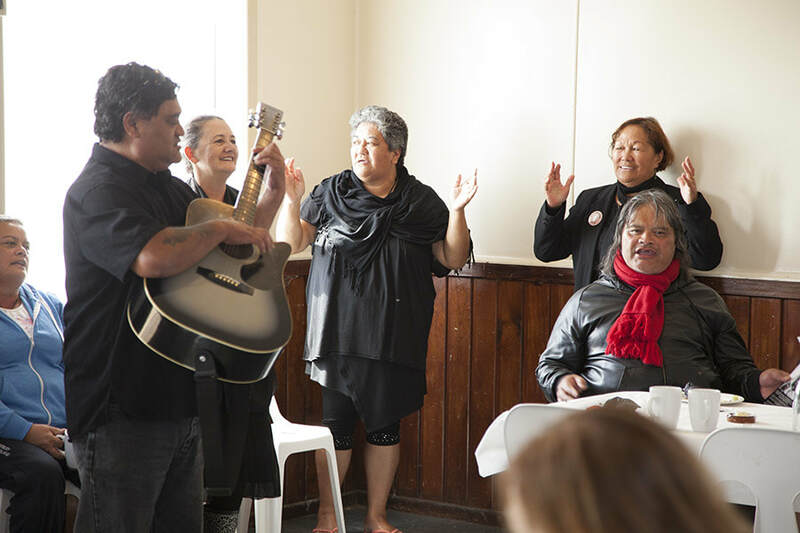 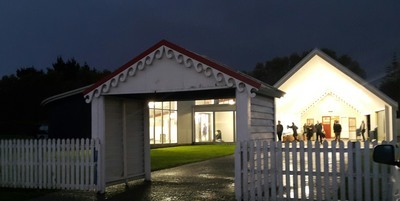 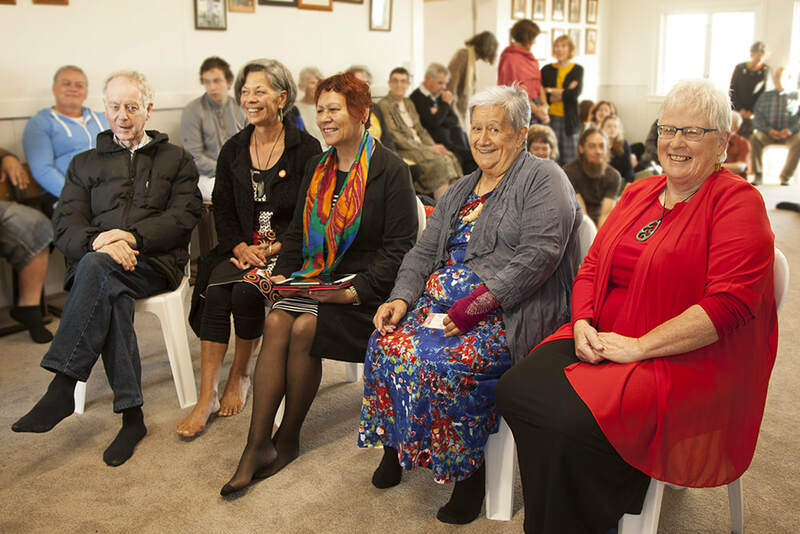 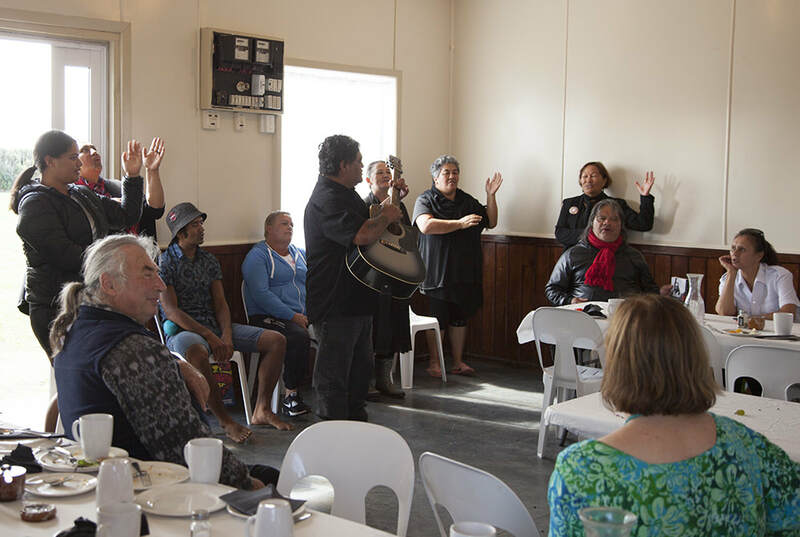 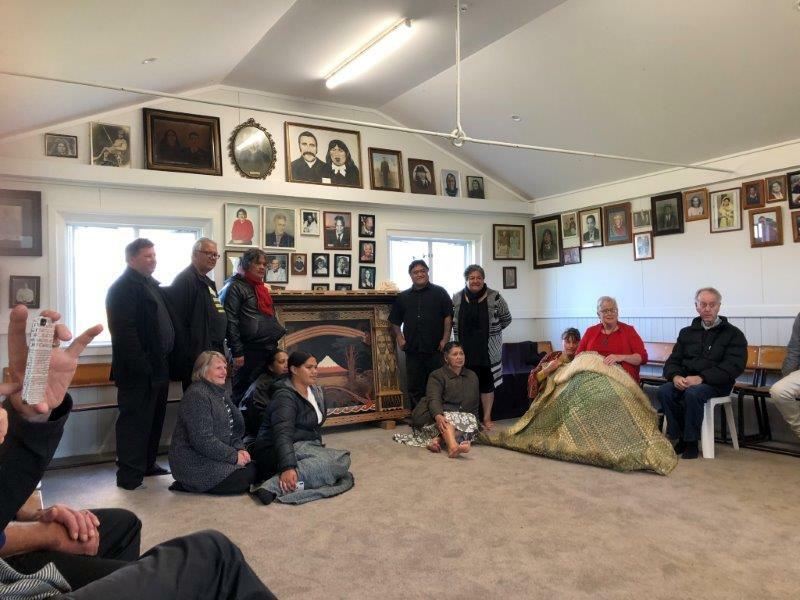 Most of my party stayed at Waiokura Marae on Friday night 23 March.
. On the morning of 24 Saturday we all assembled to Tawhitinui Marae and most of the ceremonies and discussion occurred there. Most of my party stayed overnight. 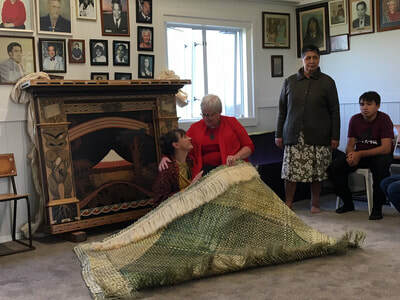 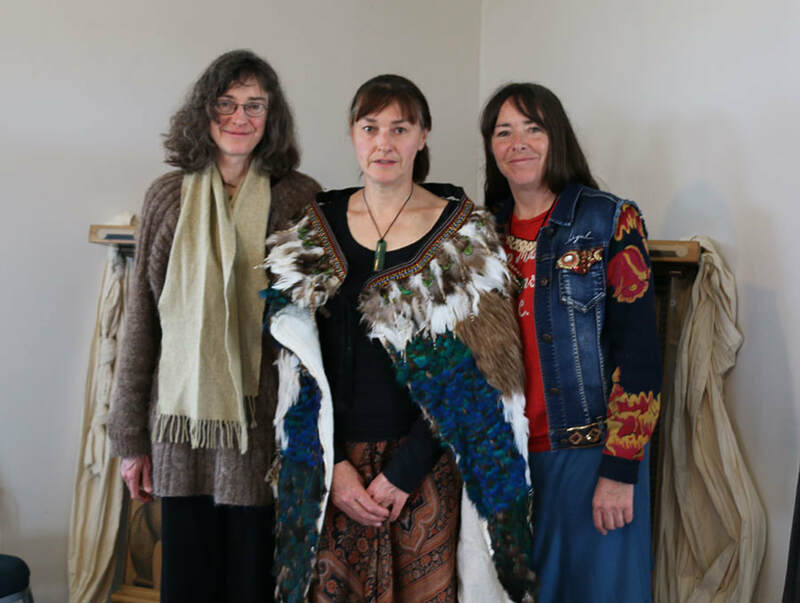 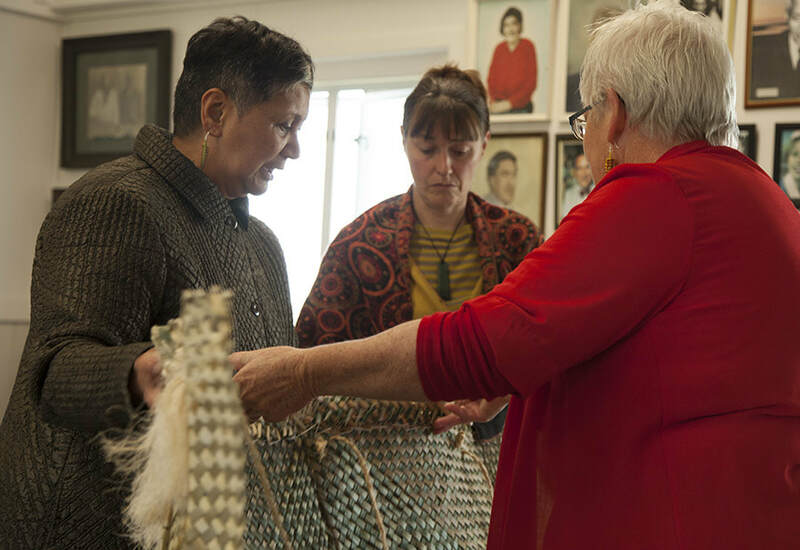 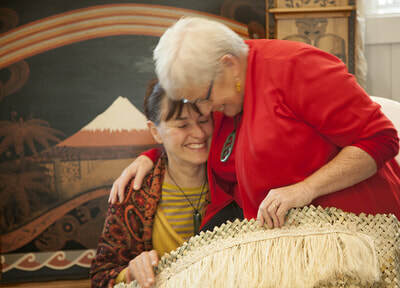 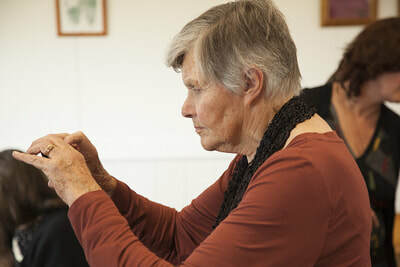 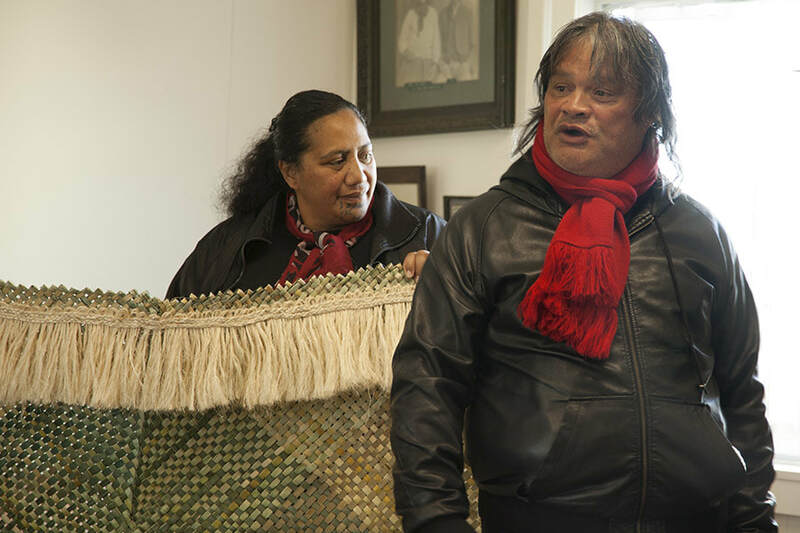 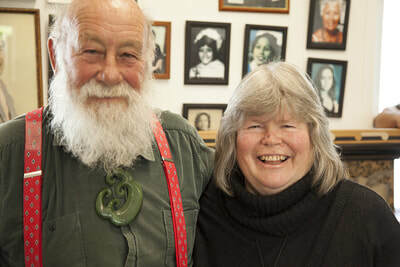 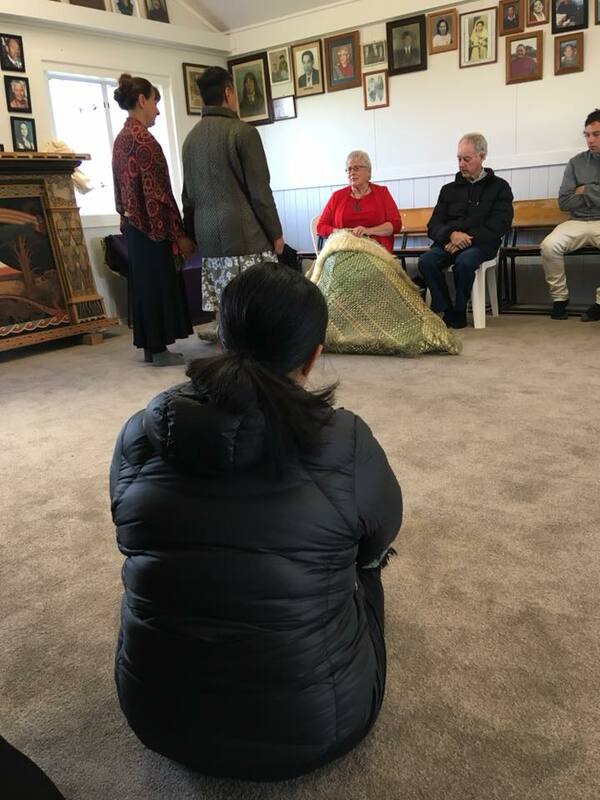 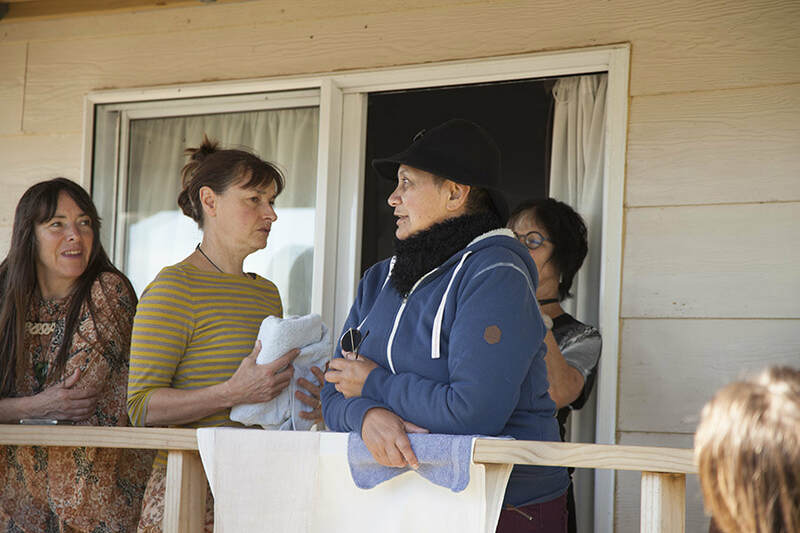 Some went home, others stayed nearby.
. On the Sunday morning, the flax korowai made by Daphne O'Connell of Kai Tahu, which cloaked Te Koha during its journey from Wai Pounamu and during the initial ceremonies, was formally received by Ngati Hāua as a taonga.
. Te Koha was then carried to Okare Tuatoru at Taikatu.
. On Monday 26th we visited Te Ngutu o Te Manu where Rukutai was able to tell us a lot about the history.
. 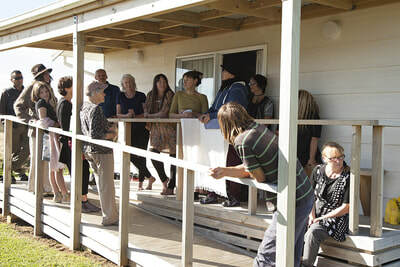 I stayed on until Wednesday, talking to people who came to visit. 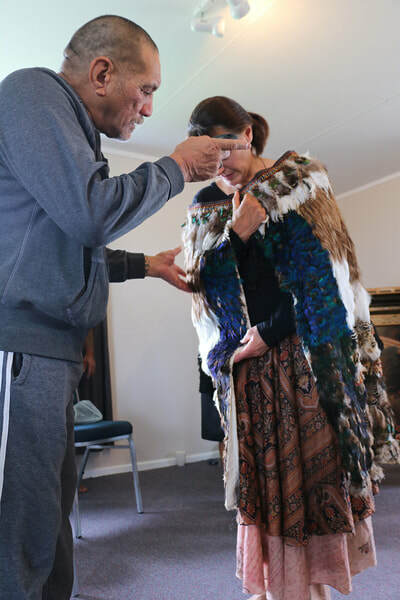 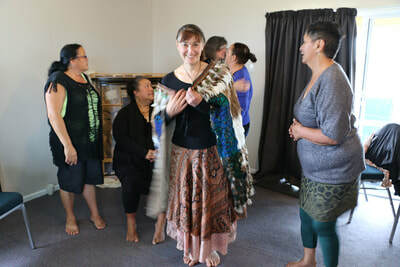 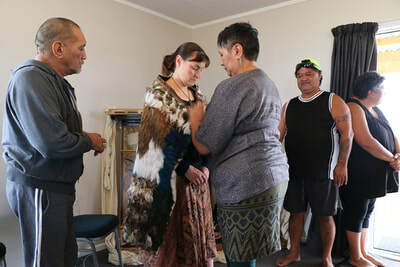 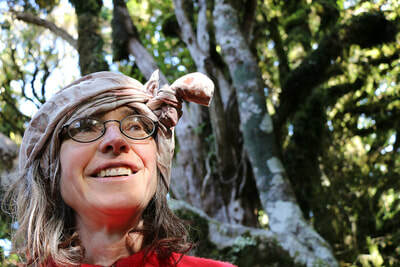 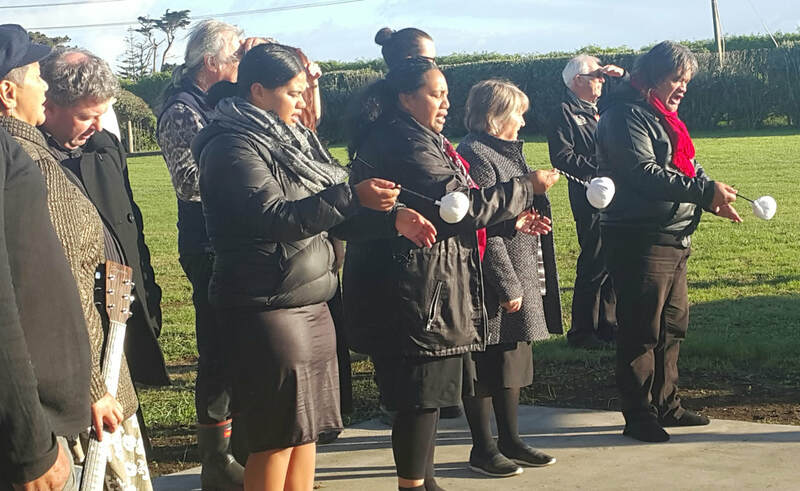 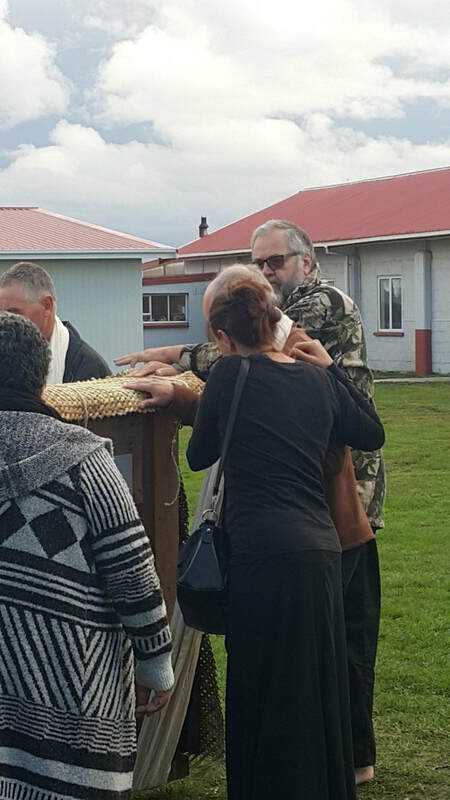 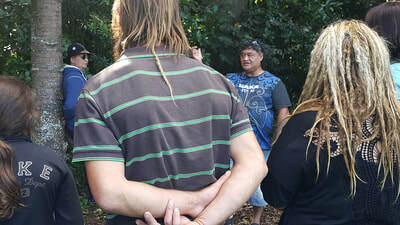 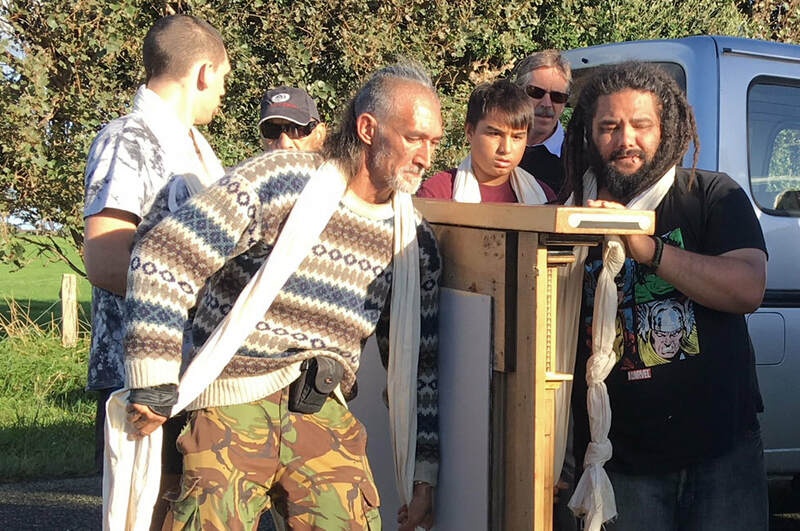 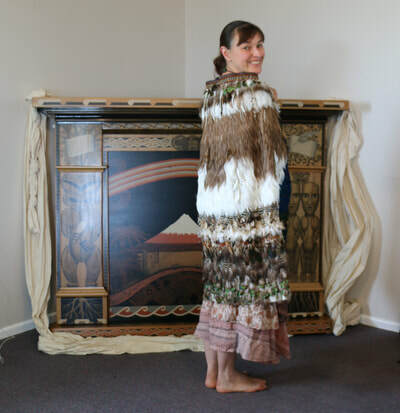 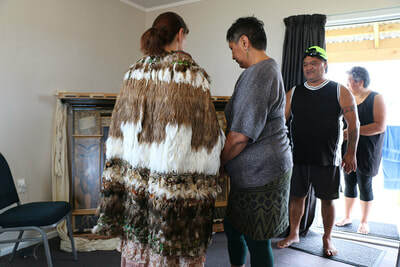 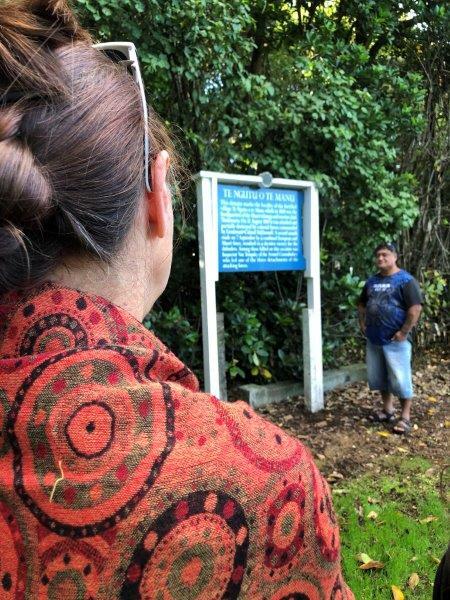 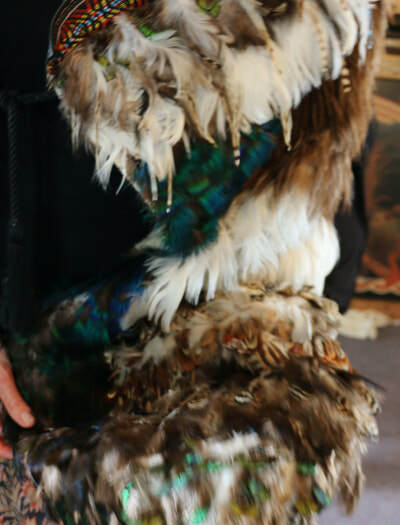 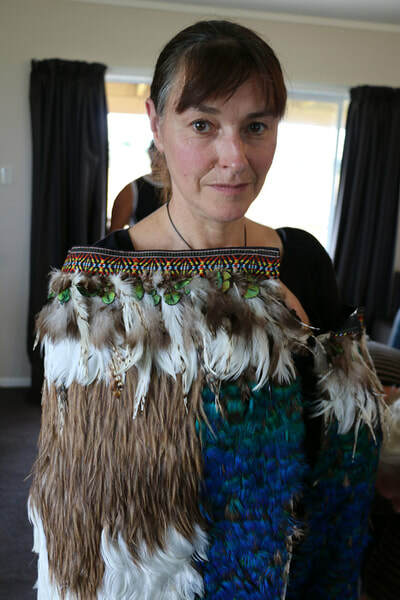 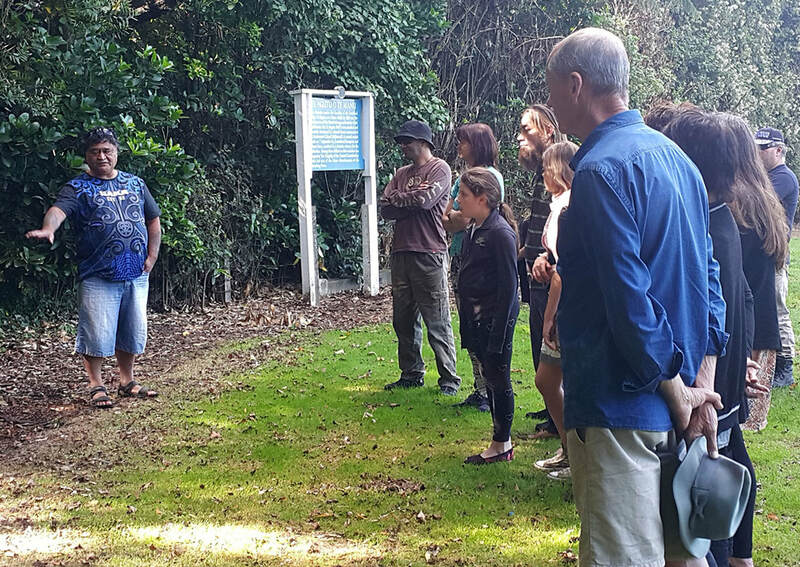 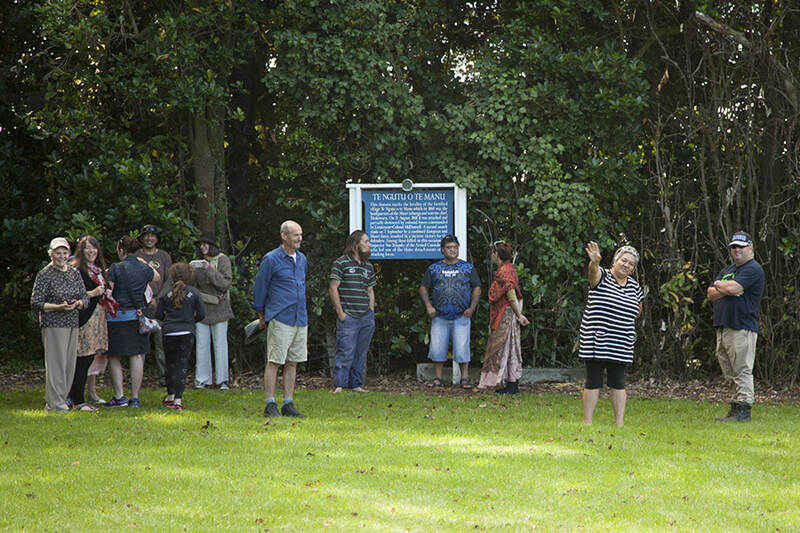 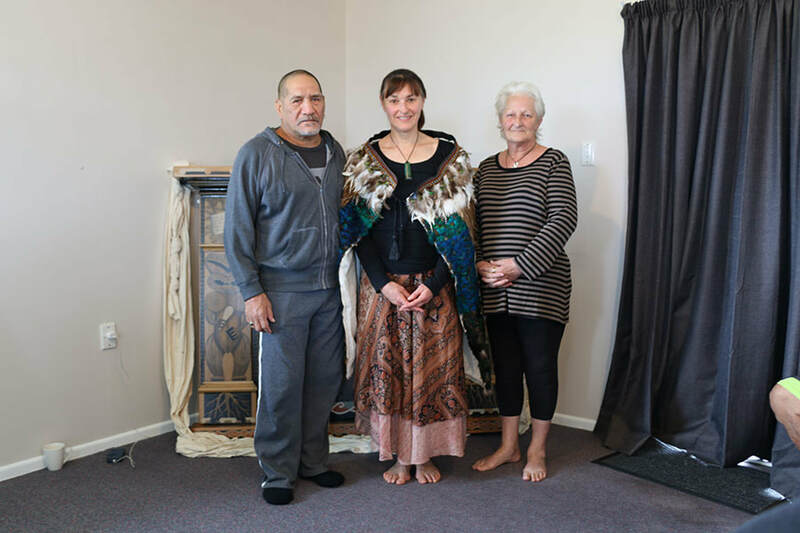 On Wednesday morning I was honoured to acknowledged in the footsteps of the ancestors by being cloaked in the feathered korowai of tupuna, Tom Tohe Pakanga Ngatai. 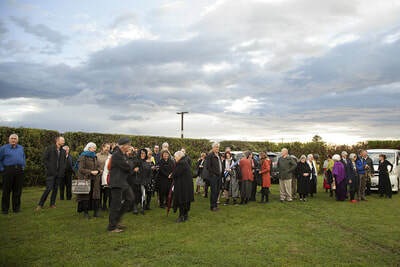 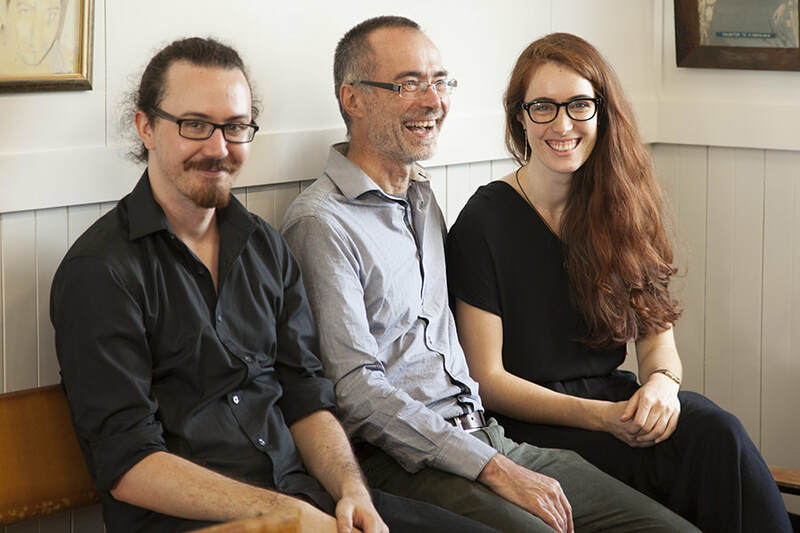 The first 24 photographs give an overview of the event (it was very difficult to restrict it to 24 as every photographs tells a story). Below that are all the photos from everyone so you all have access to them. 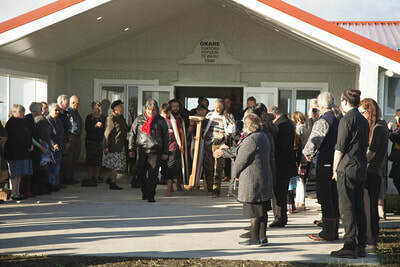 and Saturday 24 March at Tawhitinui marae. 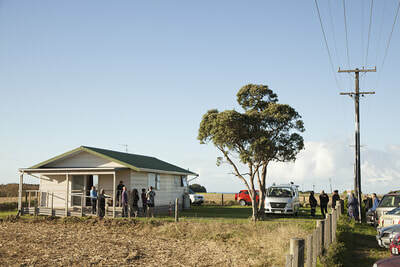 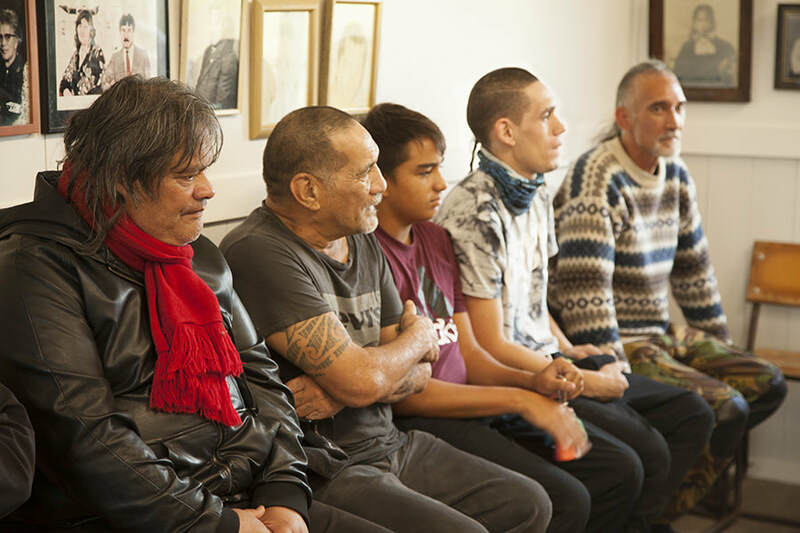 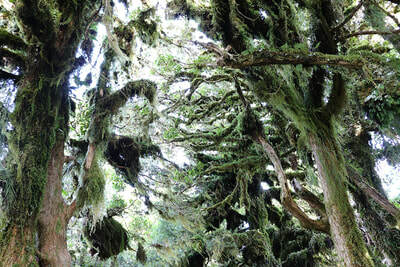 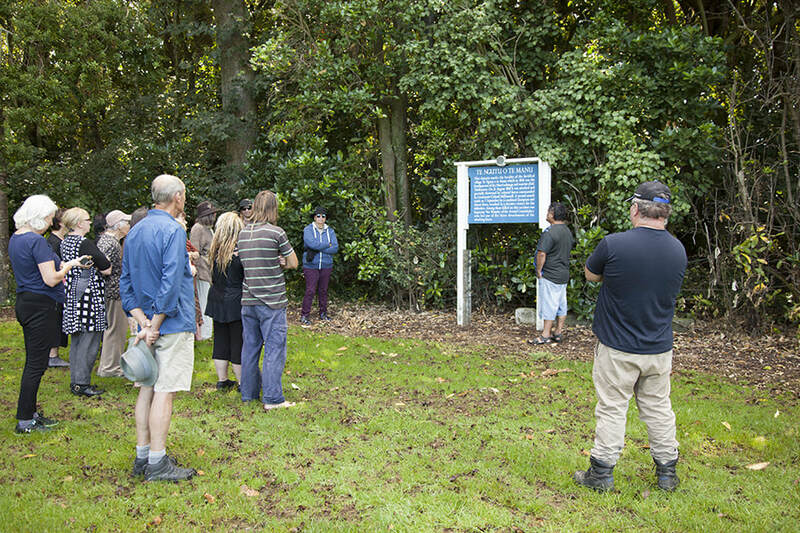 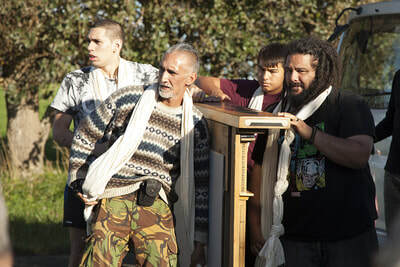 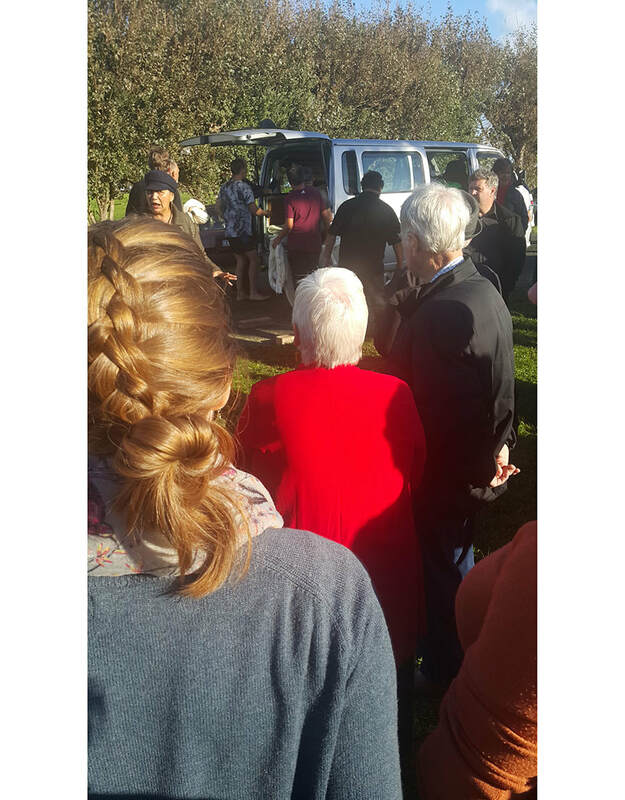 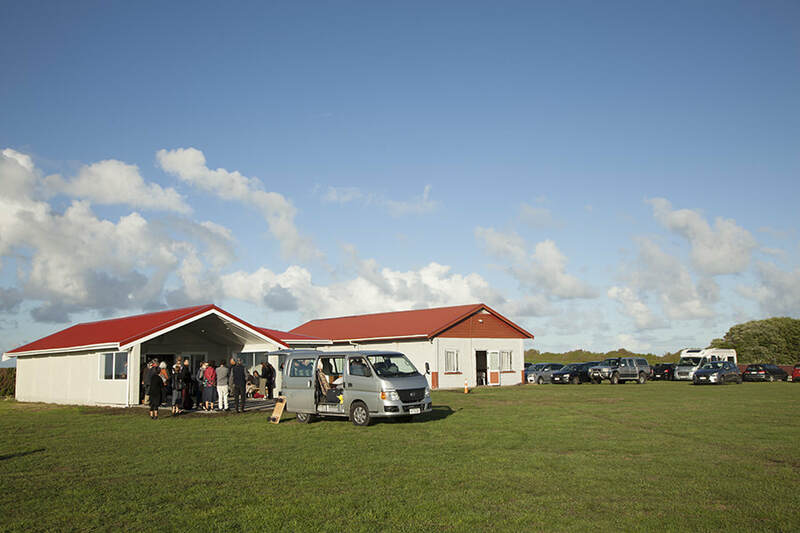 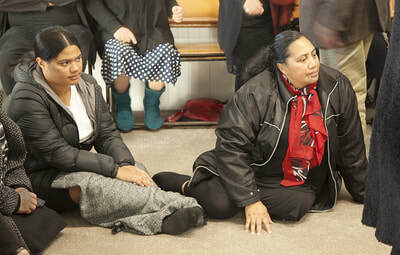 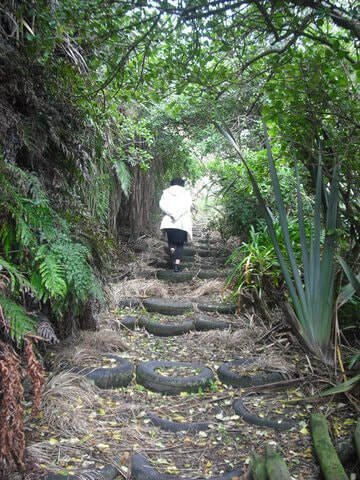 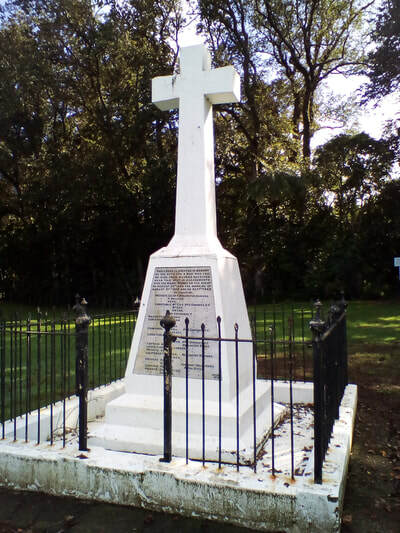 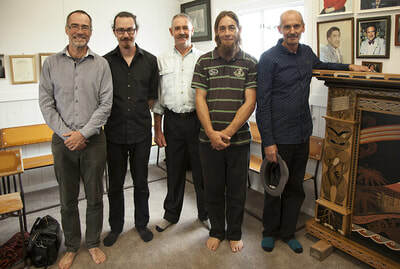 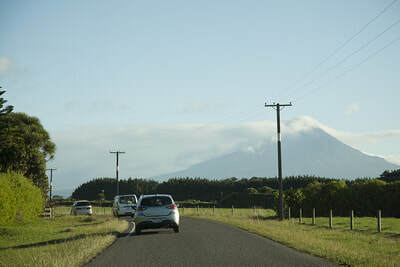 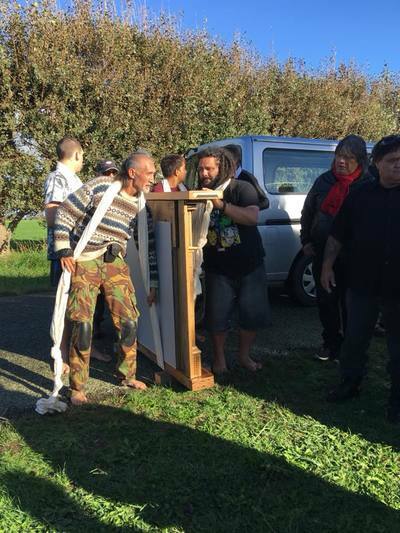 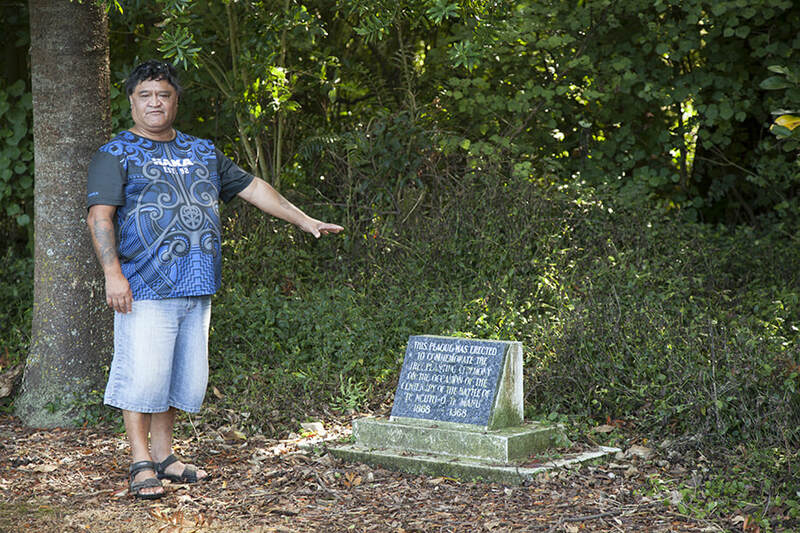 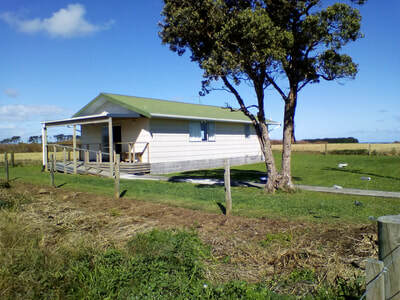 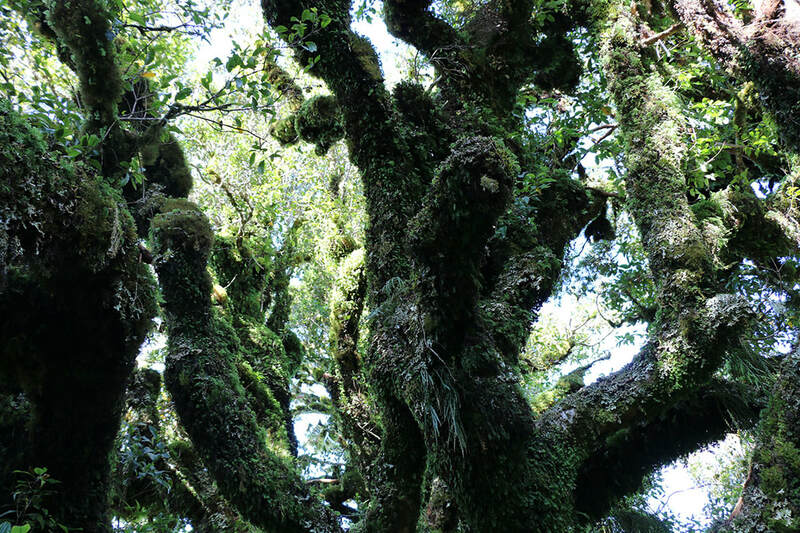 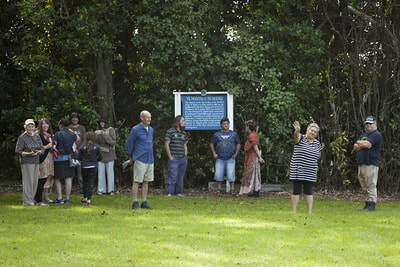 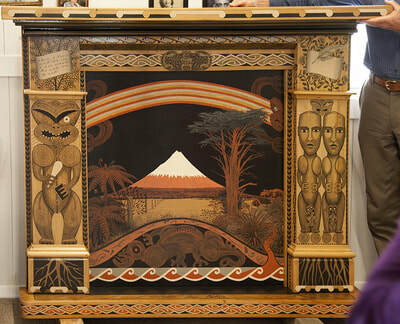 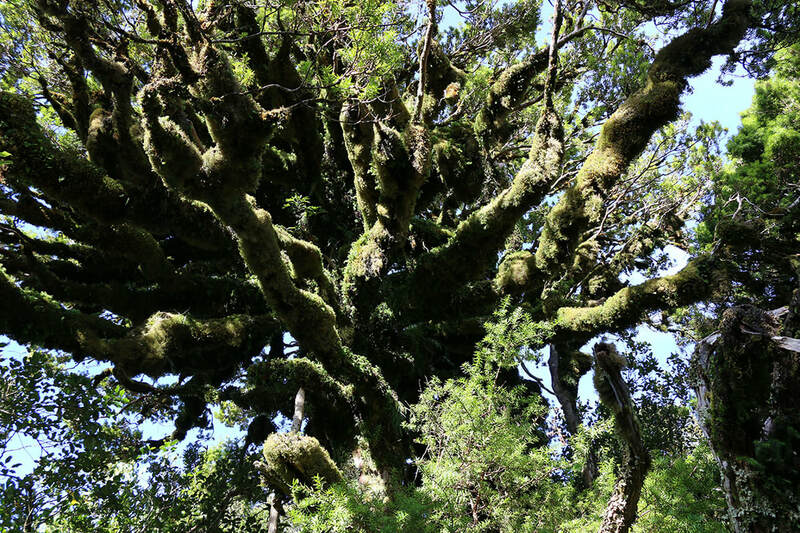 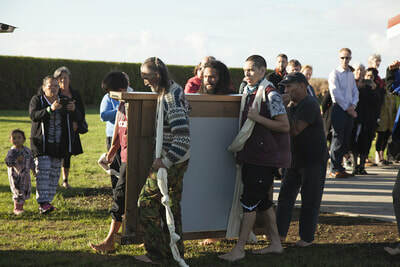 from Tawhitinui Marae 'Te Koha' was transferred to Okare marae at Taikatu in 'Te Waka o Maui' (the van).\. 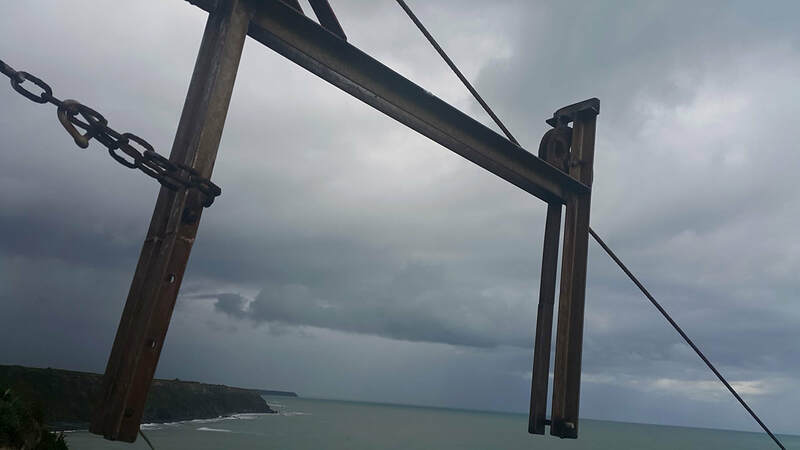 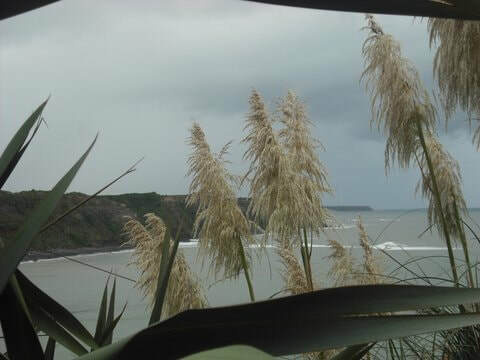 ​Lunch was at Tawhitinui. Evening at Taikatu. I was formally (and movingly) acknowledged 'in the footsteps of the ancestors' by having the beautiful, feather korowai of tupuna, Tom Tohe Pakanga Ngatai, placed on me by his descendants and whanaunga - Sydney, Te Rau Oriwa, Rukutai, Peeti, Kaye, Rhonda, Donna and Chris. 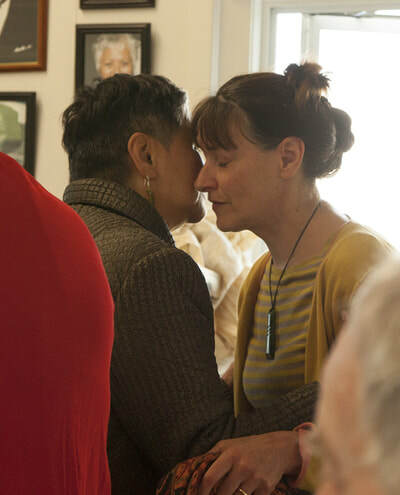 I am incredibly honoured by this acceptance and acknowledge commitment in the relationship into the future.